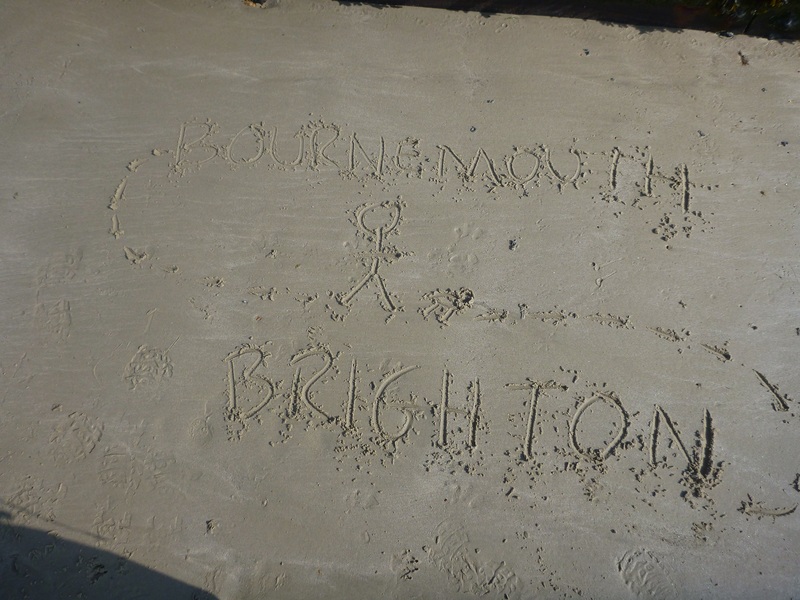 This is hike number 15 and is going to be the last stretch of the Bournemouth Pier to Brighton Pier trek. 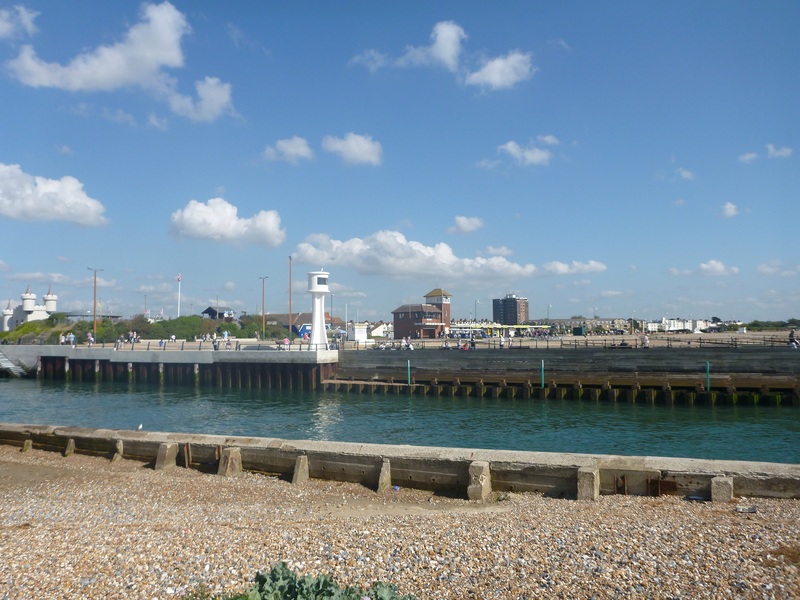 The day starts by being dropped off by Susan at Worthing Sailing Club, she is picking up Verity and going shopping for the day in Brighton, so we’ll meet up with them at the pier later. I am with two dogs today that are really eager to get walking, Kiah is accompanying Cookie. 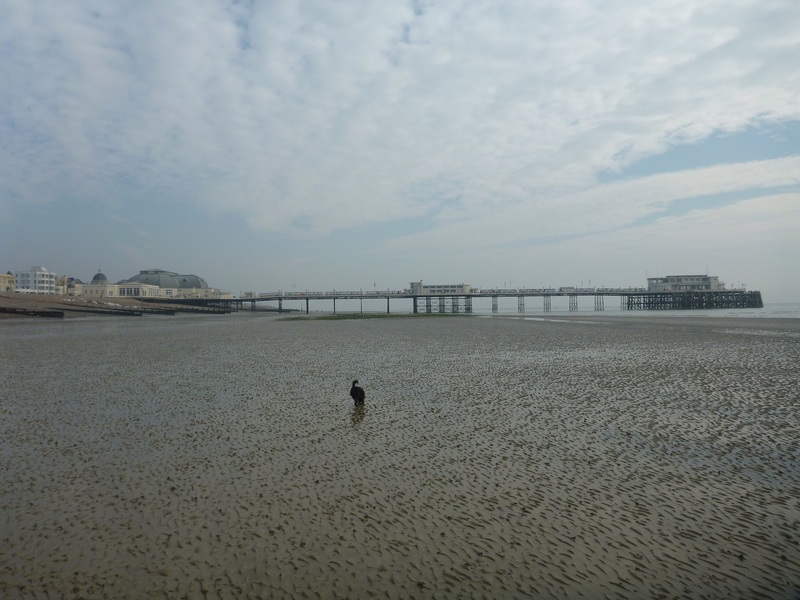 I walked up to the promenade and was really pleased to see that the tide was right out, so i let the dogs off their leads, Kiah darted straight off and down the beach and Cookie just ambled behind me. 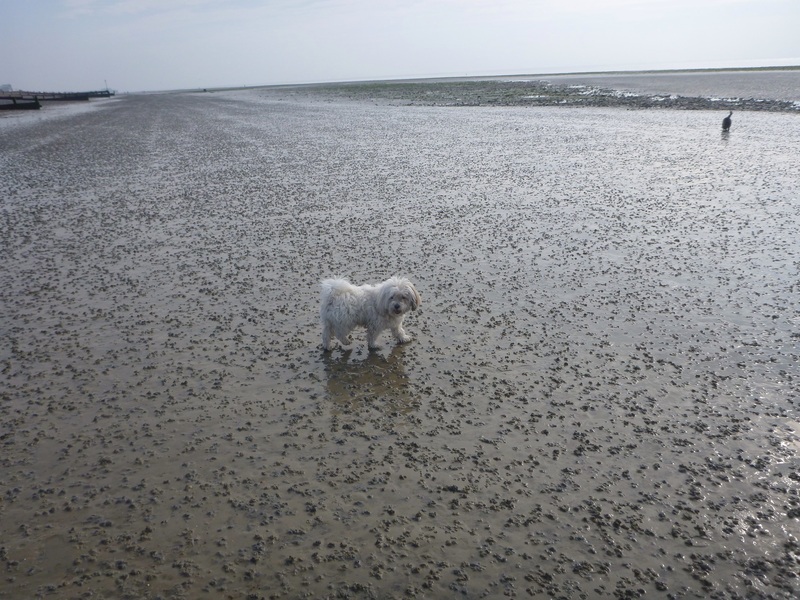 We walked along the sands for the first six kilometres until the sand had run out and became pebbles and breakwaters. 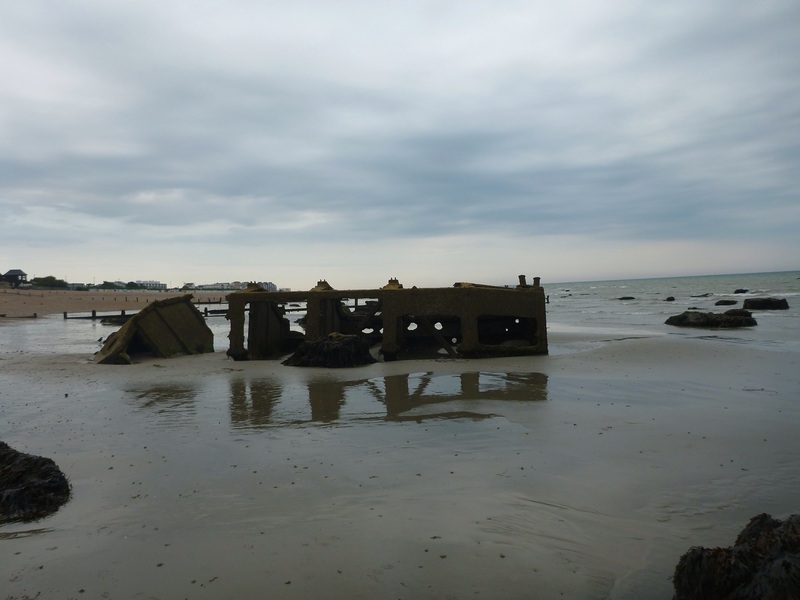 Walking on the sand meant that i didn’t see much of the foreshore part of the town, but this gave a different perspective and was much much quieter. For some reason it seems that you cover more ground quicker, but still cover the same distance. 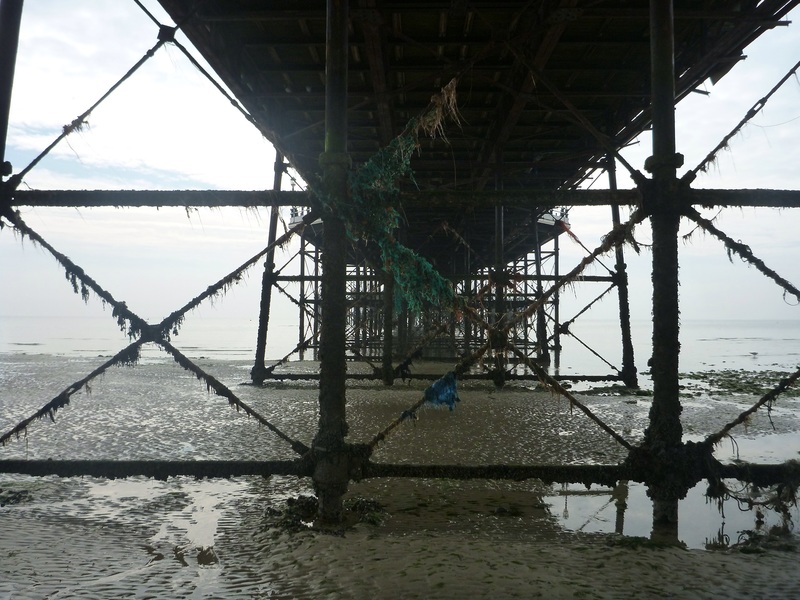 As we were walking on the beach we then passed under the Pier, looking at the seaweed clad struts that hold it up rather than walking past the more graceful promenade entrance. 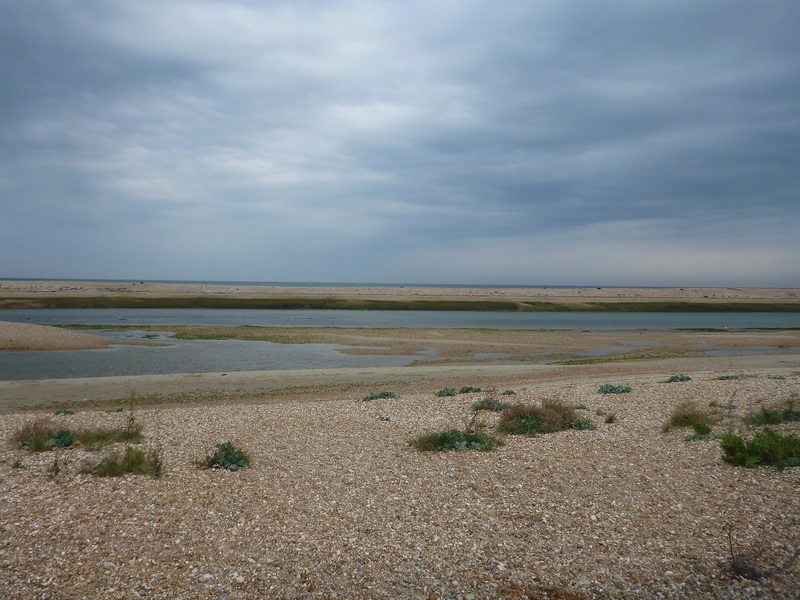 It was at Lancing that we eventually had to venture back up to the coastal path; which we followed for a short way to wide water lagoon where we stopped for lunch. 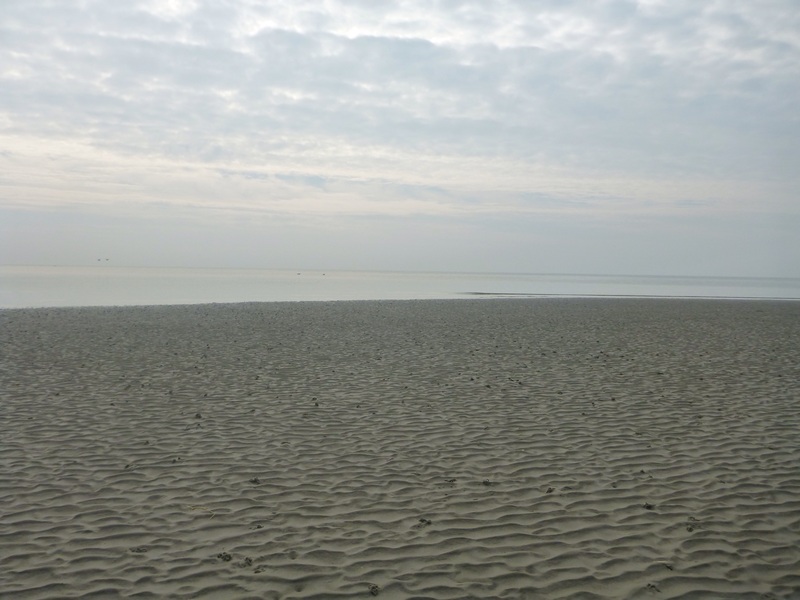 As usual there were to be many contrasts during the day as we started off by walking on the sands at a seaside resort and the next several kilometers were to be completely different and very industrious. 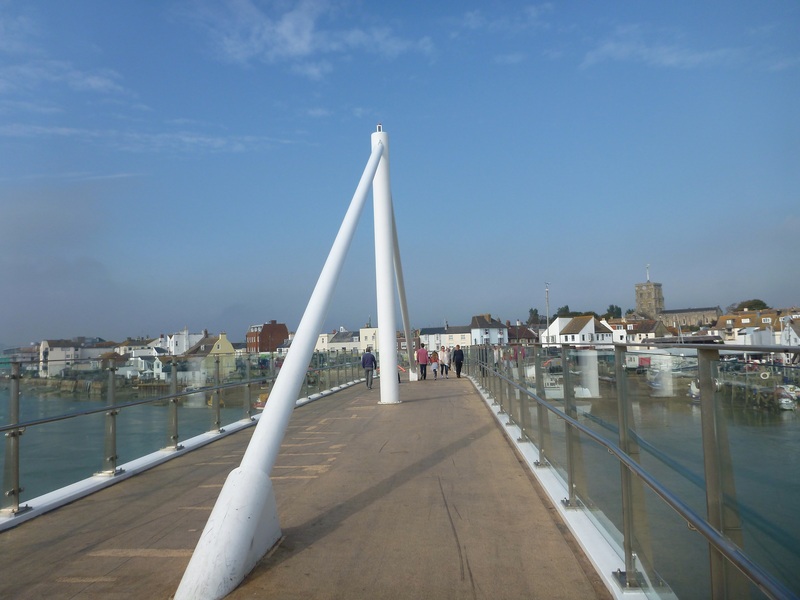 So after lunch we walked along the last bit of promenade before reaching the residential area of Shoreham Beach and meeting the River Adur. 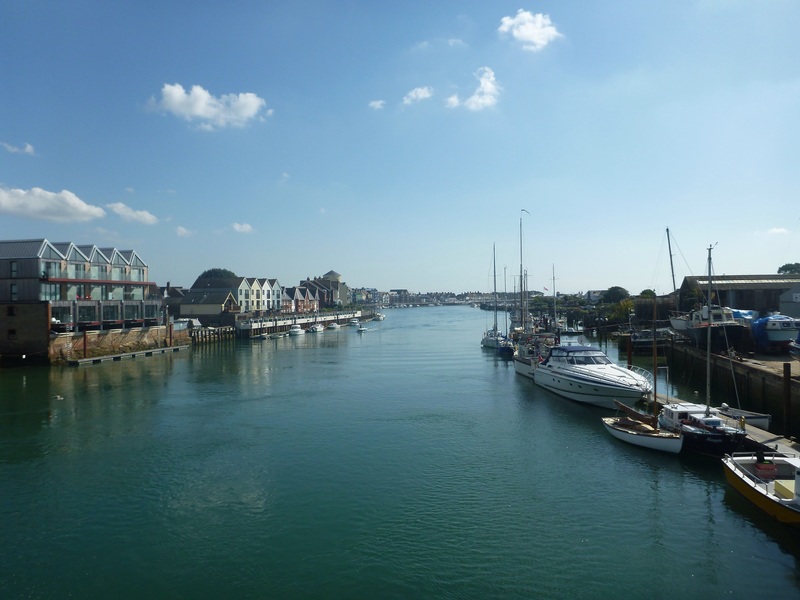 We crossed on the Ferry Adur Bridge and entered the town of Shoreham, the sun was now shining and as we walked up East Street all the cafes and restaurants had tables out in the street, you could have thought you were on the continent in some french town. The busker in the street along with the cosmopolitan feel of lots of people eating and drinking outside gave it a really vibrant atmosphere here. 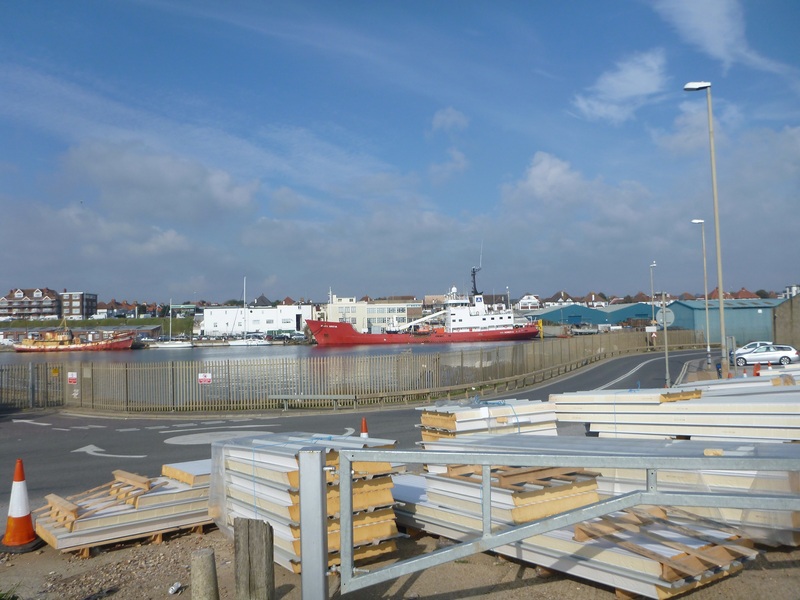 As we were leaving Shoreham the area around us had become very comercialised and industrious, on one side of the road was superstores and garages and on the other was the harbour mouth that has been here since roman times but now has scrap metal merchants and gravel yards, not the nicest part of the walk. 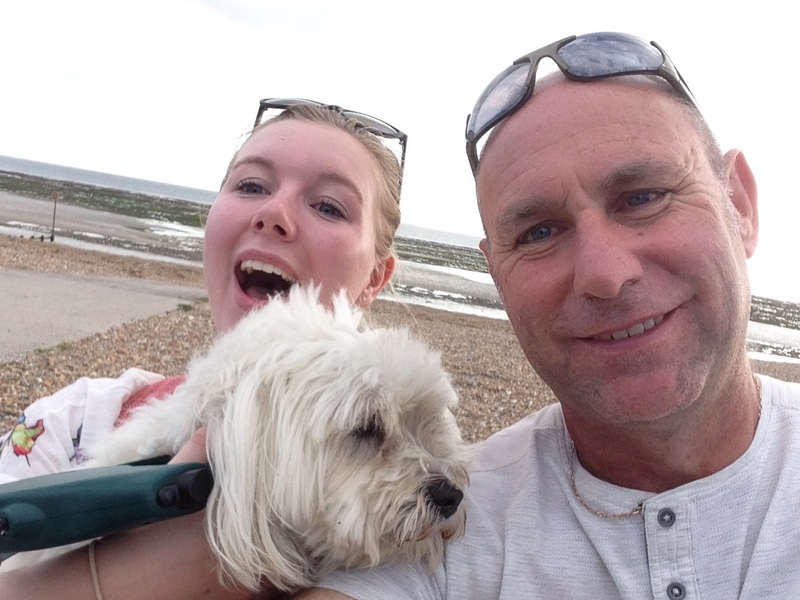 After a short while we reached the lighthouse; which is known as Kingston Buci or Shoreham lighthouse. 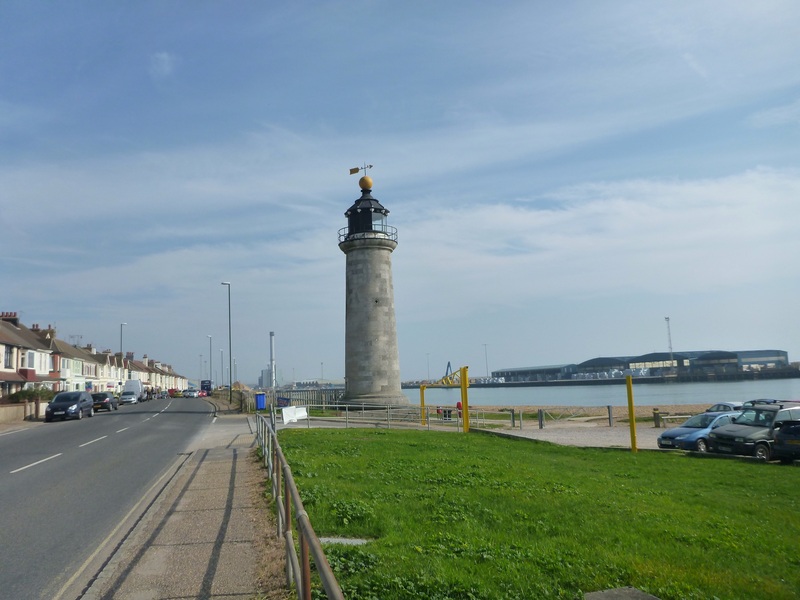 This lighthouse dates back to 1842 and was lit initially by oil lamps. 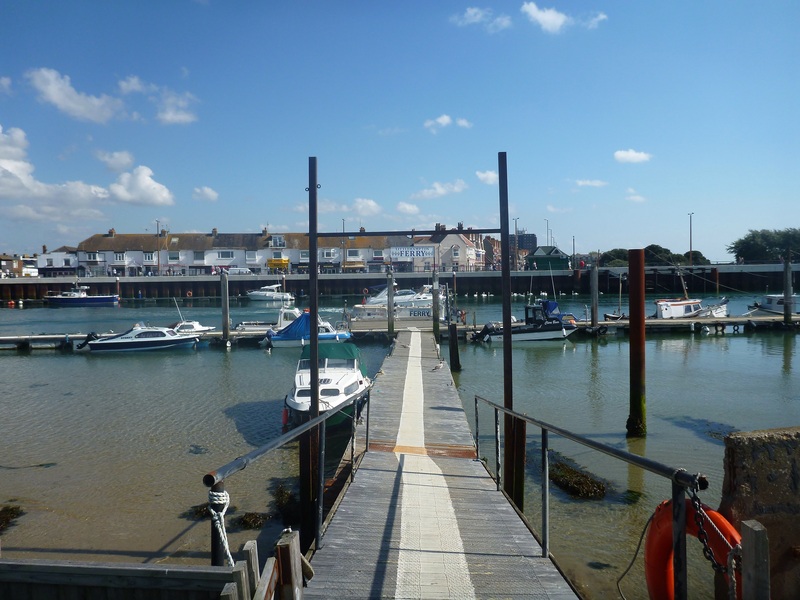 The lifeboat station stands prominantly on this part of the harbour too as the mouth of the Adur is directly in front with Shoreham Canal to the East and the River Adur to the West. 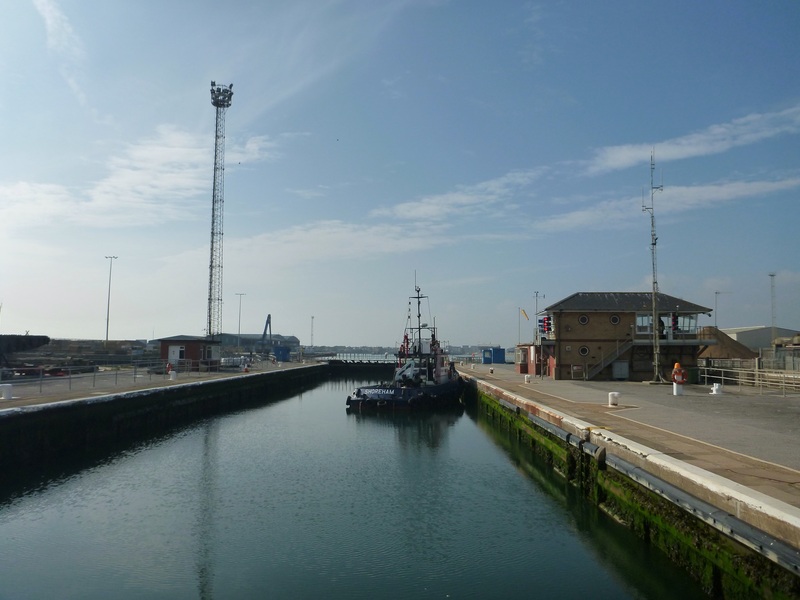 I followed the harbour on the north side for a little bit further until i reached the lock gates that were built in 1855. 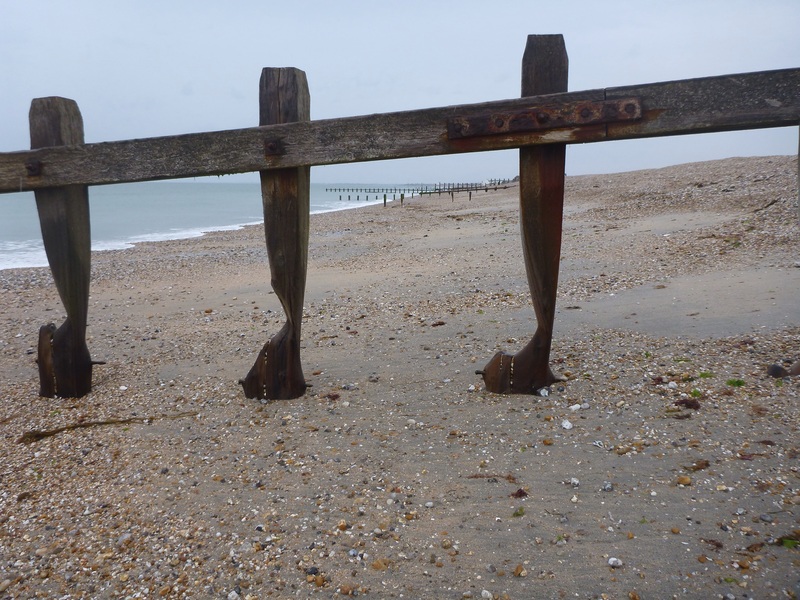 These gate are to enable the shoreham canal to remain full at low tide, keeping ships afloat in the harbour. The lock is the biggest that i have ever seen as it is sized such that it can hold a ship, the lock can be crossed by foot and on the other side of the canal you came up to a promenade once again; which funnily enough is also the end of the Monarchs way, a long distance footpath that starts in Worcester and marks the route that was taken by King Charles II as he escaped the Battle of Worcester, the path is 615 miles long so perhaps i’ll walk that one another day!! 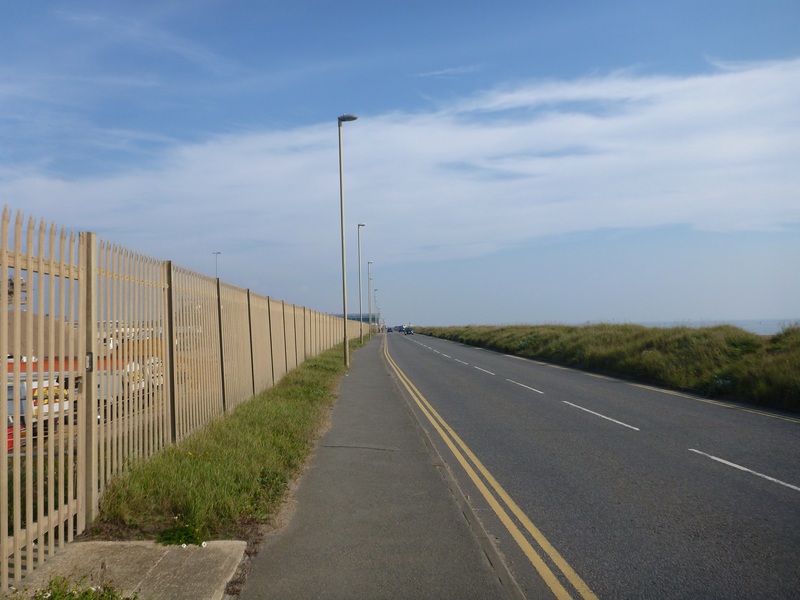 The promenade was short lived and i had to then drop down to the path on Basin Road South, which was behind a big wall and seemed to go on for ages and ages. 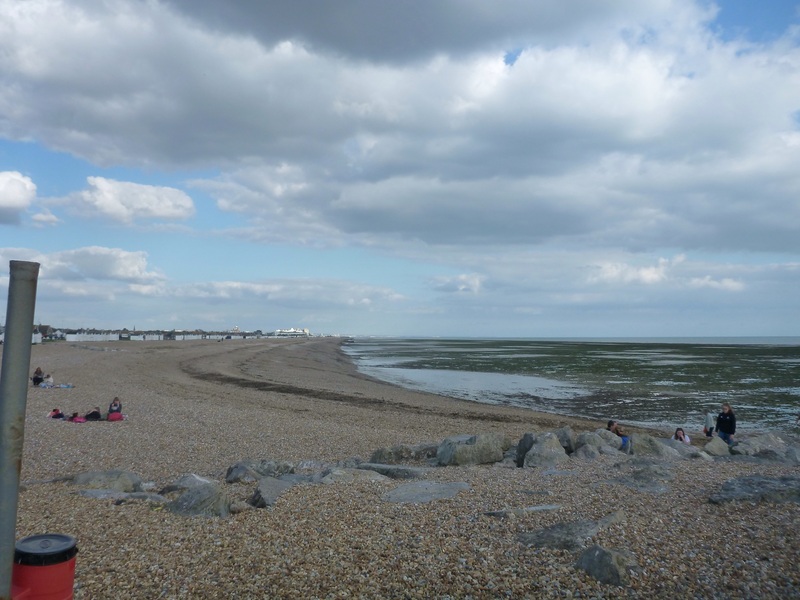 I was so pleased when i reached the lagoon at Hove’s Western Lawns as i knew from here it would be a completely different scene, from the deserted Basin Road South to the bustling promenade of this popular resort. 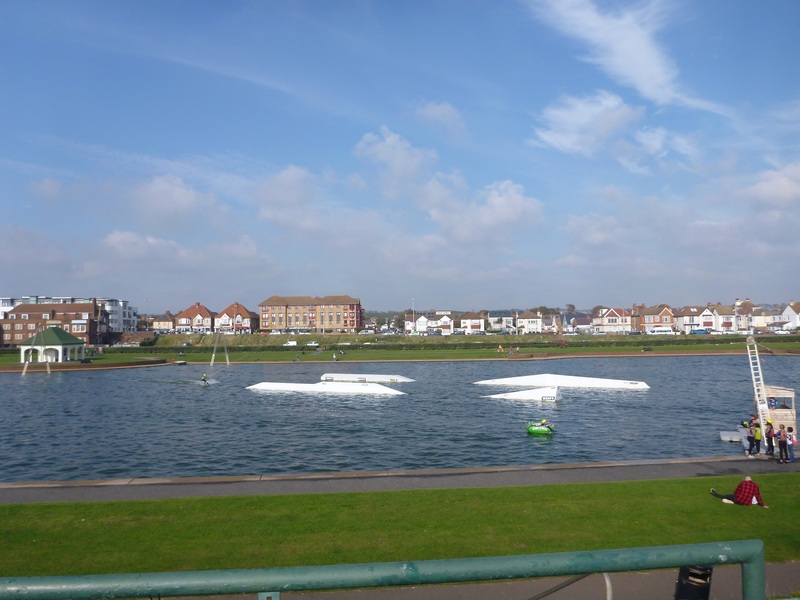 Literally in a few steps we was out of the comercial harbour and in to the exclusive resort of Hove with it’s very civilised foreshore of public lawns and lagoon; which was very busy with people learning to paddle board and wakeboard. 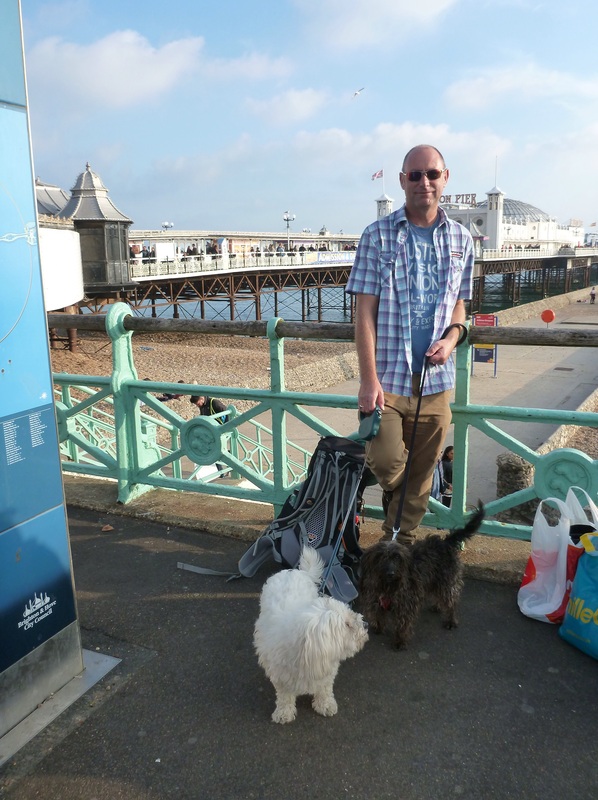 The promenade here was now very busy and as i passed Hove Lawns people were boxing, playing with rugby balls, attending weddings as a party walked past me and just watching the world go by from their beach huts. I let Susan know that i would be finishing in about half an hour as she must be nearing her shopping by now too. 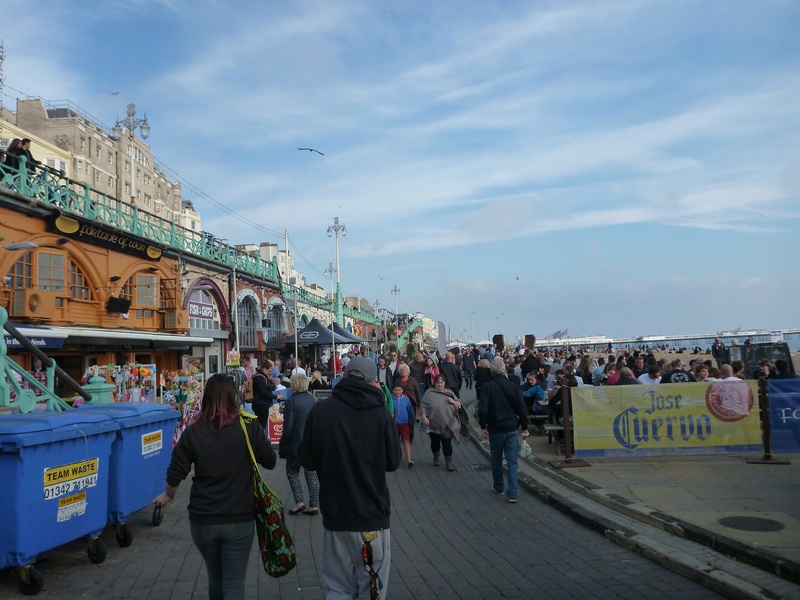 We continued along the promenade and i’m sure it ws getting even busier as Hove merges into Brighton, i couldn’t believe that amongst all the people that i bumped into Sharon, we had a quick chat and then went our opposite ways. 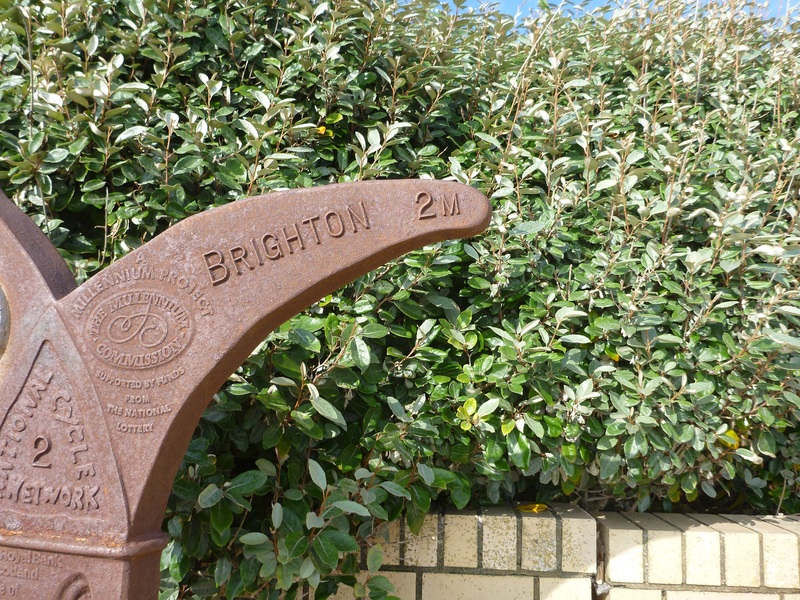 We are in Brighton now and the last part of the walk takes us past the new i360 tower that is being built and then past the arches on the lower path of Brighton Seafront. The cafes, bars and shops were teeming with people here, listening to the DJ’s and live bands that were playing. 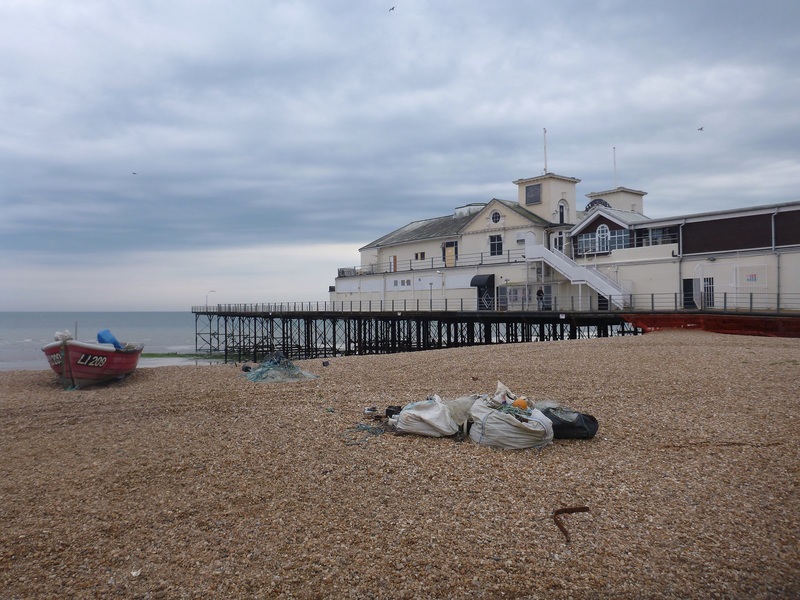 I was certainly thinking that it would be great to have a pint here, however i would save myself until i got to the pier, where i would crack open a bottle of Prosecco and have some fish and chips. 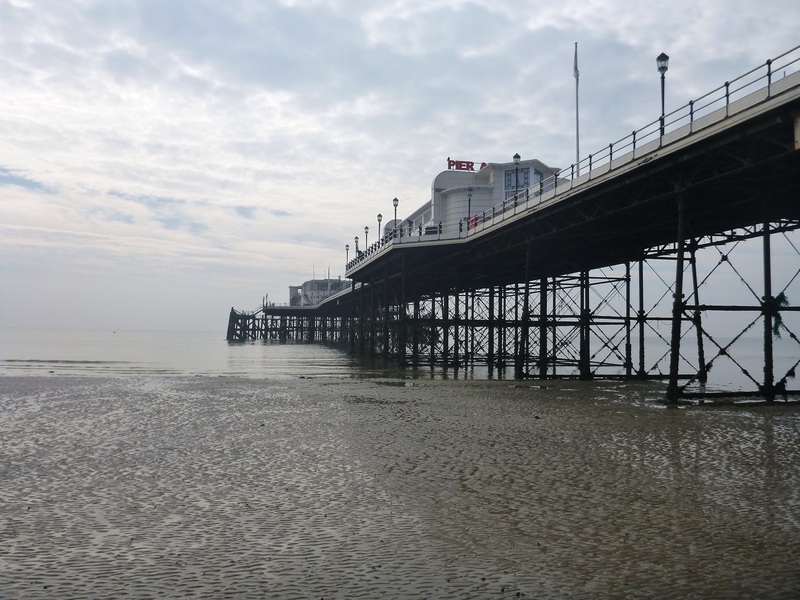 I reached the pier in about the half an hour that i estimated and had a good look amongst the crowds to see if i could see Susan and Verity, but i had beaten them there, so i waited patiently for them. About 45 minutes later they turned up with bags of shopping and promptly said that we need to go and pick up more that they had left in some shops, so the perfect end to the walk of celebrating the 176 miles travelled on foot from Bournemouth Pier to here with a glasss of prosecco and fish and chips ended up in carrying shopping bags through the town to the shops to pick up more. Laden with a rucksack, two dogs and loads of Verity’s shopping bags i somehow was not going back to the beach now and so we just caught the over crowded train back (football had been on). In my mind i had decided that if i couldnt have fish and chips here then i wouldnt be having them anywhere else tonight. 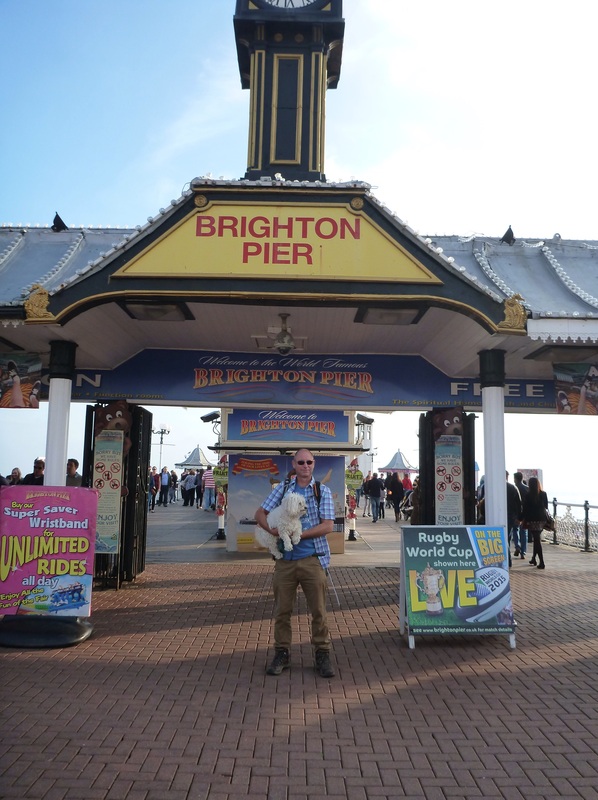 So after 283 km (176 miles) i have reached Brighton Pier. 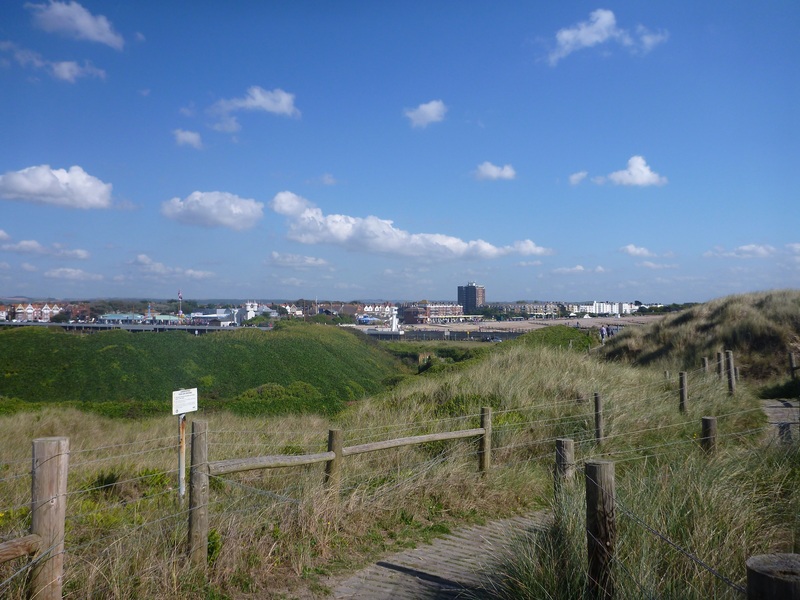 The changing coastal scenery between Bournemouth to here has been absolutely amazing, but ultimately started and finished at very popular seaside resorts. 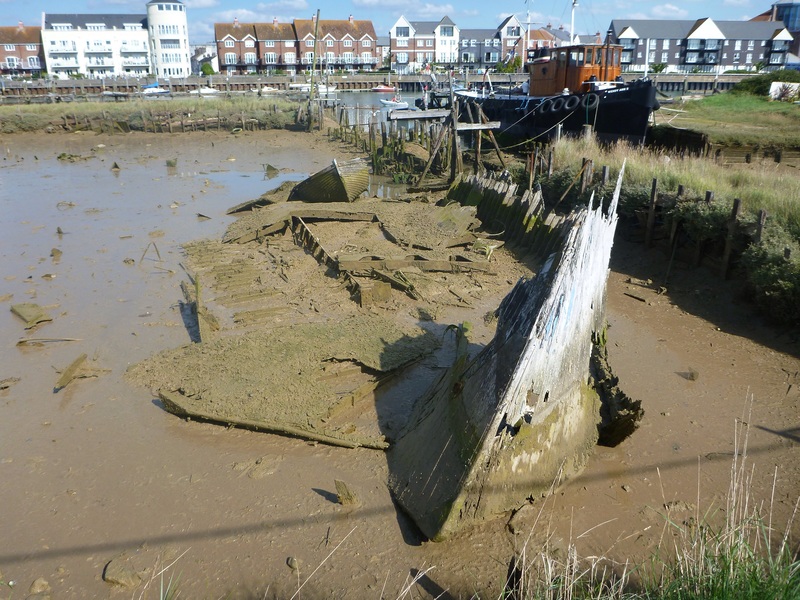 I had been on numurous buses and trains, getting to and from the start/finish points and also on five ferries of varying size that would get us across the many river estuaries. What a fantastic coastline walk in the sunniest part of the country. What am i going to do now? Today I am to be joined by Verity who wants to see how long it would take for her to walk to Conor’s house from ours, not sure the full reason why she wants to see how long it takes but it is great to have some company of the two legged kind nonetheless. The day started by walking out of our front door rather than having to travel anywhere, it almost felt that i had forgotten something. Shortly after leaving and while we were still on our estate i heard this loud calling of “Ding, Ding” from behind, i couldn’t believe it but my brother Paul and his wife Bev came whizzing up behind us on their bikes, how random is that! They had decided to seek some sun so had ventured south from Scotland. Verity asked if they had cycled all the way and this was going to be the start of her sayings for the day. 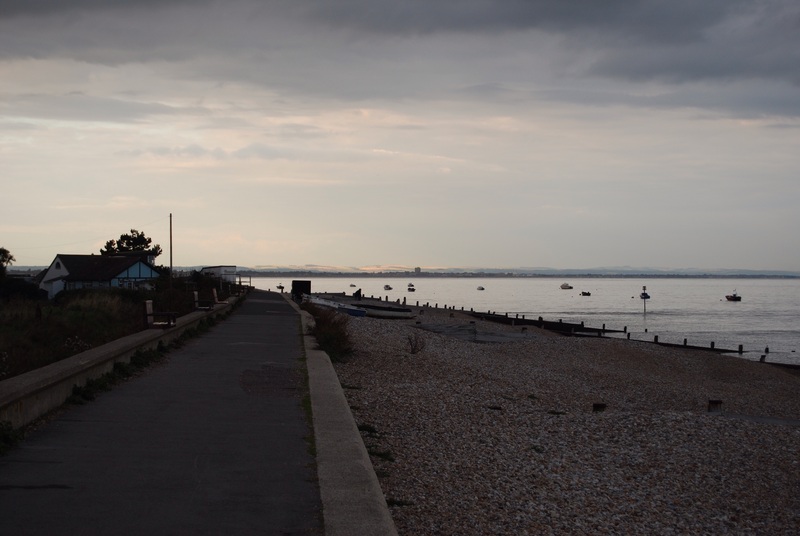 We got to the seafront at the end of Fourth Avenue on the Summerley Estate, which is where I left off last time. 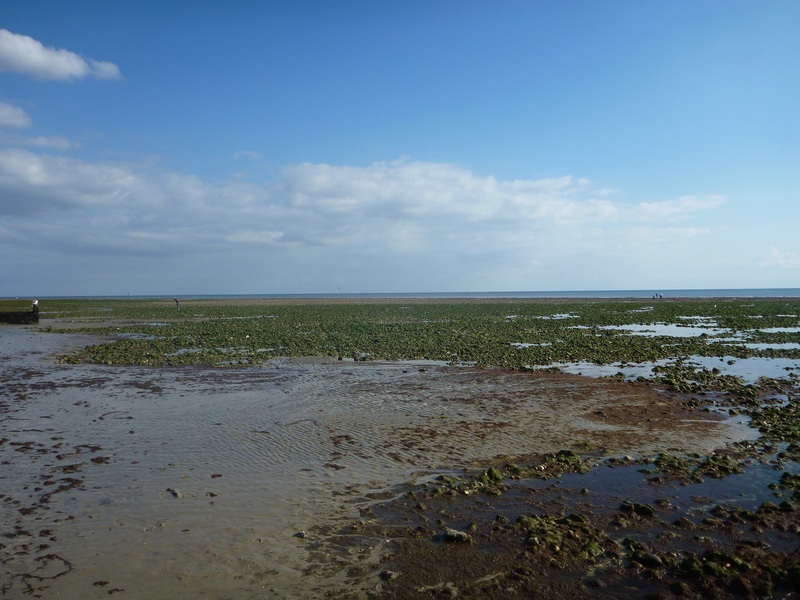 The tide was high, the sky was as blue as it could be and there was a slight breeze, what a perfect day for trekking. 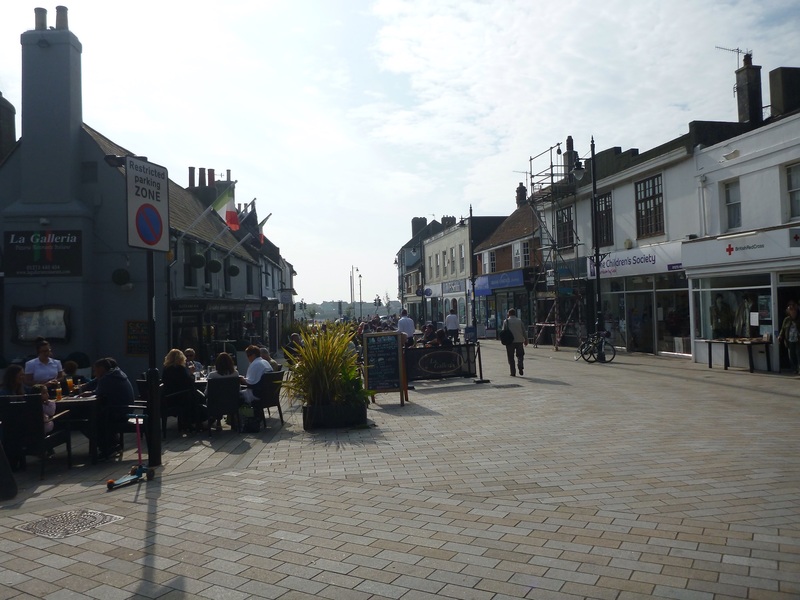 We headed East and it wasn’t long before the promenade finished and was replaced by the grassy greenswards at Middleton on Sea and then by the pebbles at Elmer. Elmer was always subject to flooding and some time ago they made some rock islands which would break up the waves before they could pound on the shoreline, they have certainly worked as Elmer has not flooded since. 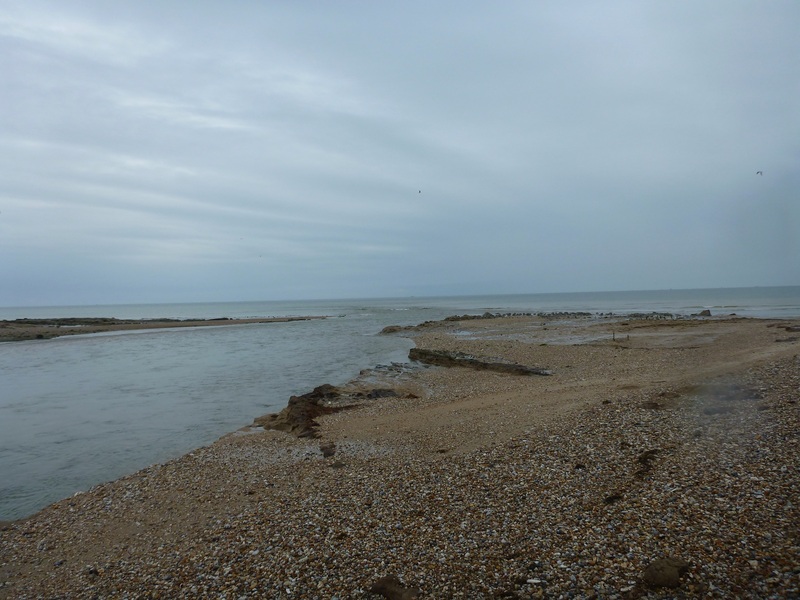 The islands have changed the coast along here as you now have massive expanses of sand behind them that can be seen when the tide is out, these are formed by the new currents that swirl around this part of the coast now. Just past the Elmer beaches the path got a bit more firm under foot for a short while until we neared climping car park, this is an area where many day visitors can park up, have BBQs and play games on the grassy car park, the beach here is quite stoney with only a little bit of sand at very low tide. The car park also has a cafe and some toilets, but no other facilities. The sun was shining very brightly by now and it was also nearing midday, Verity had her cool shades (sunglasses) on and proceeded to tell me that whenever she wears her sun glasses she says that she can’t hear properly……really!! From here until Littlehampton we are to walk past the last remaining undeveloped piece of coastline between Bognor Regis and Brighton called the ‘Climping Gap’ which is a beautifully secluded Site of Special Scientific Interest, with incredible sand dunes (one of only three in West Sussex) that are home to rare and protected wildlife. 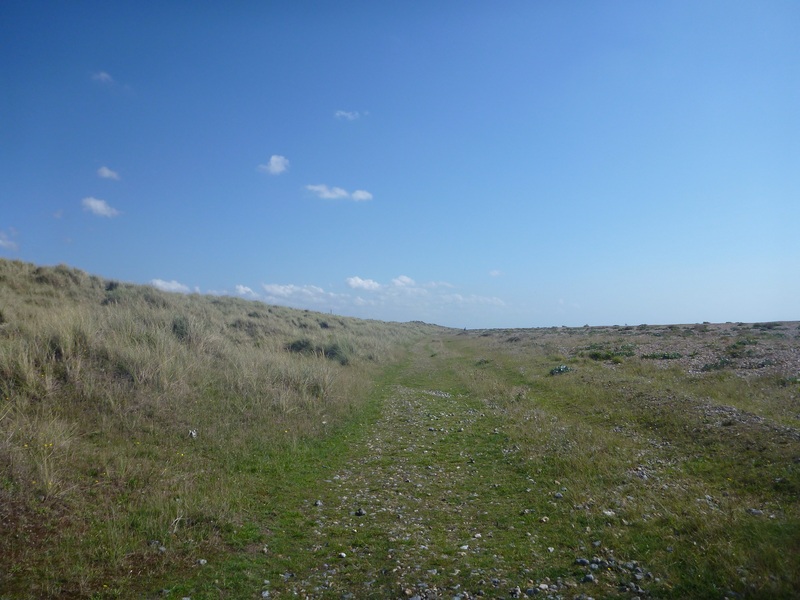 It also forms part of Littlehamptons West Beach where we joined a short board walk through the dunes, past Littlehampton Fort and to the western edge of the River Arun estuary. 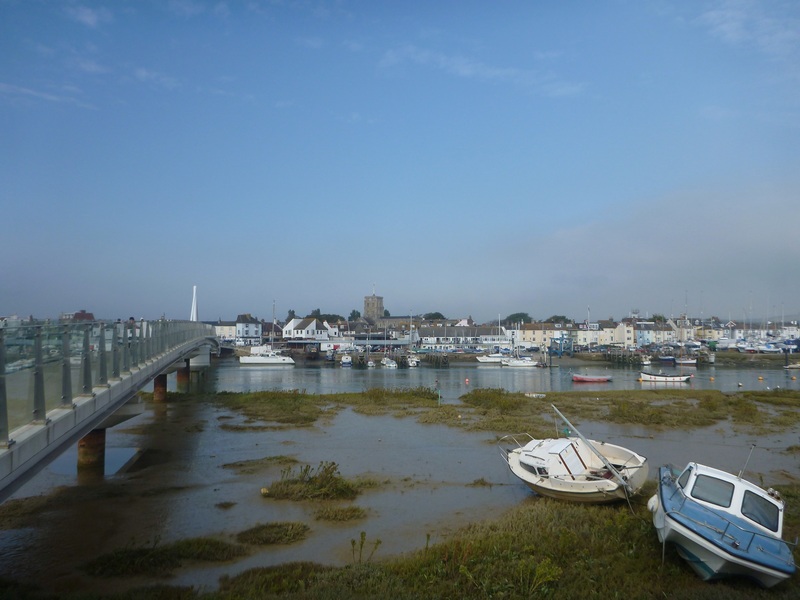 From West Beach there are two ways that you can get to the town of Littlehampton and that is either by ferry that only runs through the summer months or head further inland and cross the retracting footbridge, unfortunately for us the ferry had only just finished for the season, so we had to walk further inland to cross on the bridge. Once on the other side of the River Arun we headed back to the seafront along the newly refurbished waterfront walkway, passing the Blue Peter 1 lifeboat, Look and Sea Centre, the many day trippers sitting opposite the chip shops eating their fish and chips and the youngsters were crabbing over the harbour wall, with buckets full of the crustaceans. Back at the seafront the we joined the promenade that passes by the amusement park with its small roller coasters and log flumes. 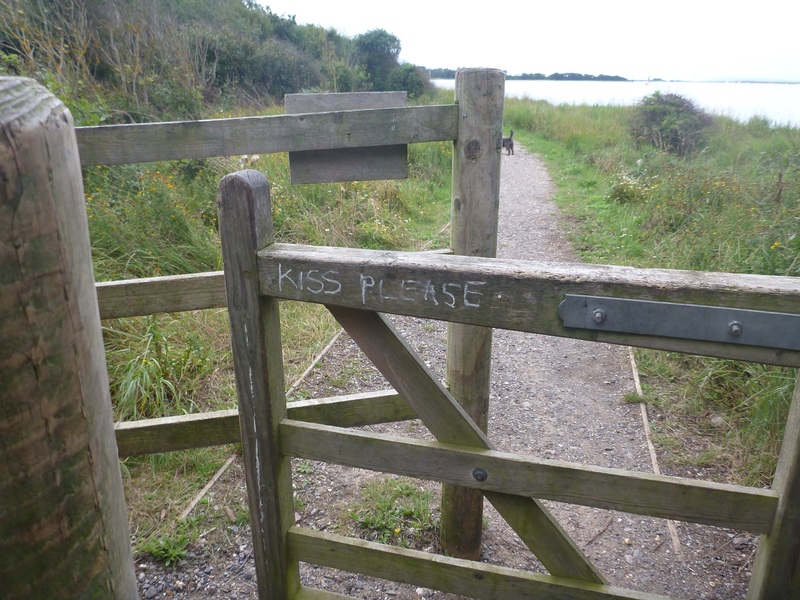 On this promenade it also has the longest bench in Britain which winds itself along the wall and under shelters where it goes a bit wild, not sure you could really call it a bench here but it is certainly one long length and doesn’t break. At East Beach you’ll find a cafe that has won many awards for it’s archetectral design, it’s supposed to represent a piece of driftwood, which it looks like but i have heard many different local representations. We stopped here for a well promised ice cream, so i had a 99 flake and Verity had a caramel milkshake (with ice cream in). 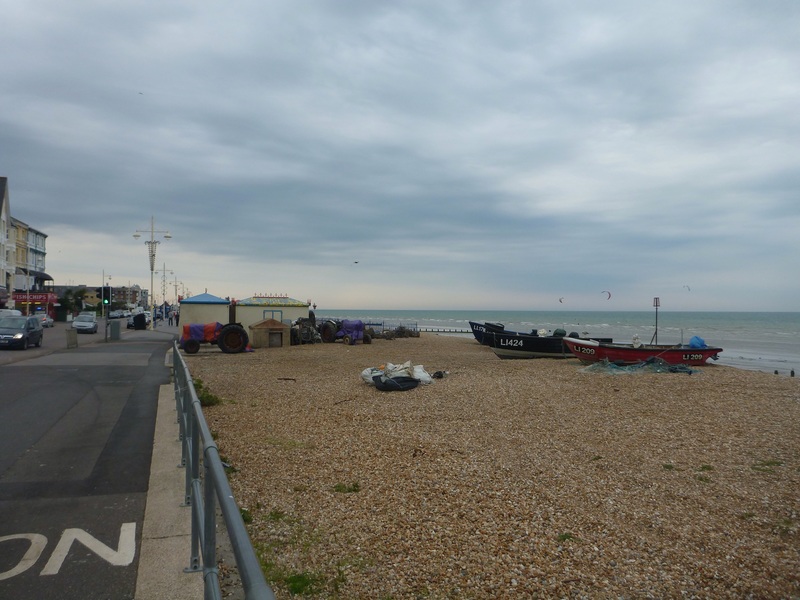 Heading Eastwards from here we followed the promenade past the rest of Littlehampton and Rustington where it finished and went back to pebbly beaches again, from the busy beaches of Littlehampton, we are now seeing less and less people. 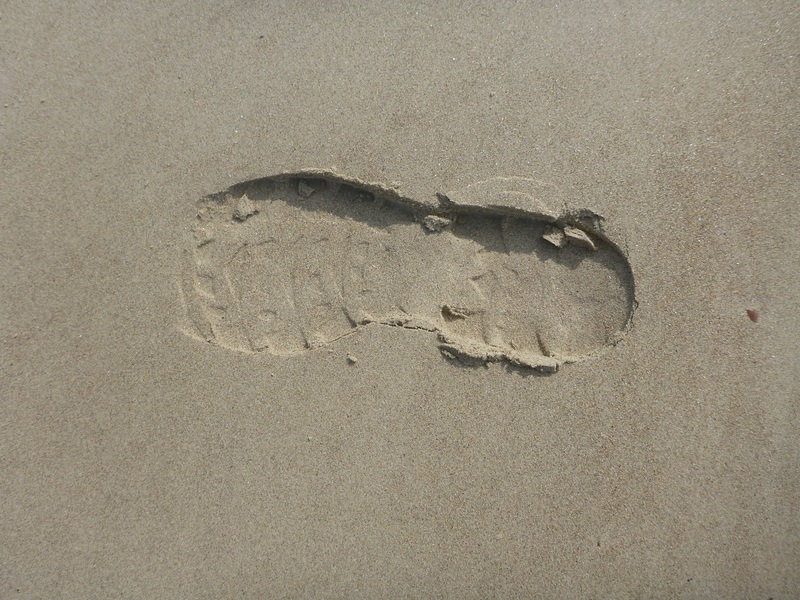 We decided that from here we would go down and walk on the sand as walking on pebbles seems to feel like you are walking twice as far. 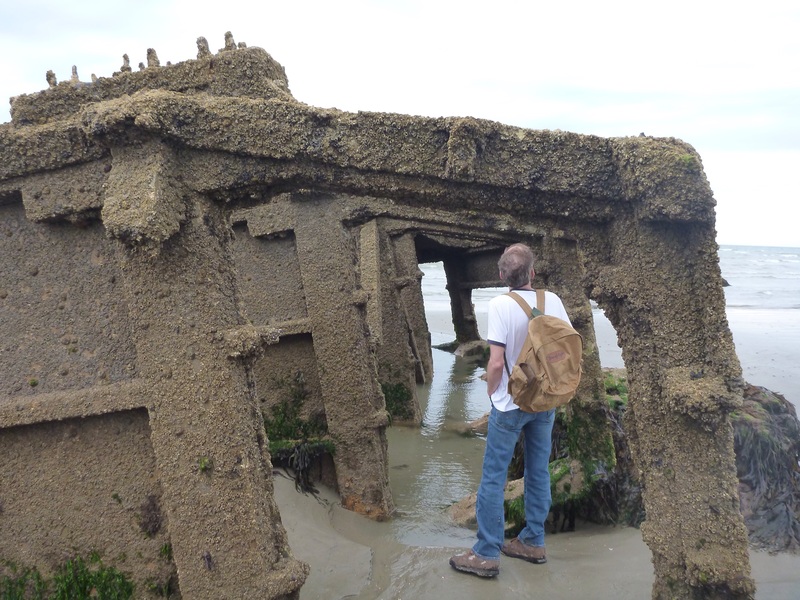 Walking on the sands and small rocks took us past some exclusive residences of Angmering, East Preston and Kingston. 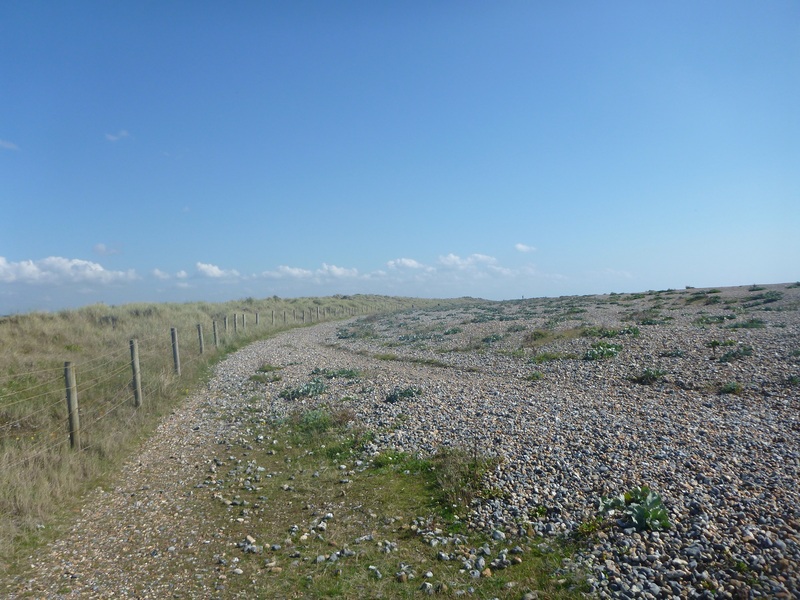 At Goring Gap we headed back up to the foreshore and walked along the grassy path that divides the greensward and the beach, before long we were at the Sea Lane Cafe; which meant that we would soon be nearing the end of our trek for the day. 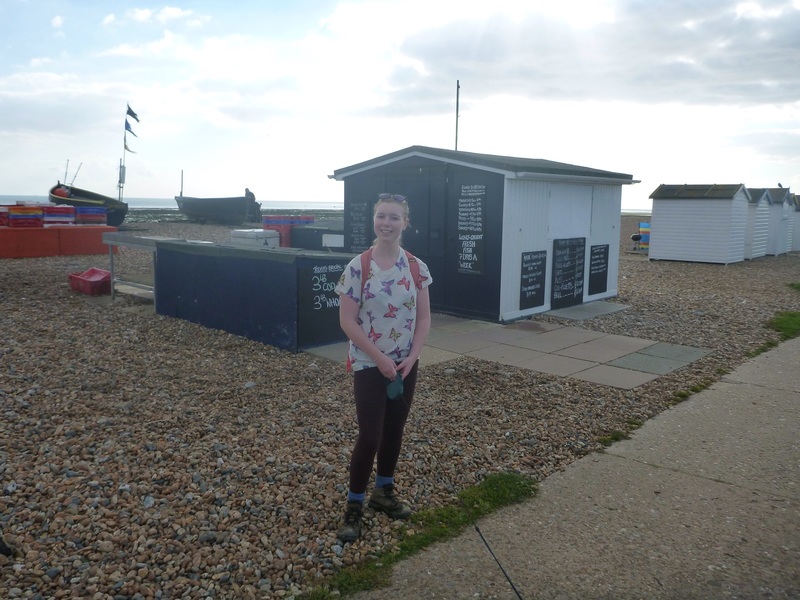 We continued past the beach huts and fish merchants until we got to Worthing Sailing Club; which was to be the official finish for the day. But we needed to head for the station so we decided not to go on to Conor’s but to knock at Matthew and Gemma’s to see if anyone was in, but unfortunately nobody answered, to the station it is then………. 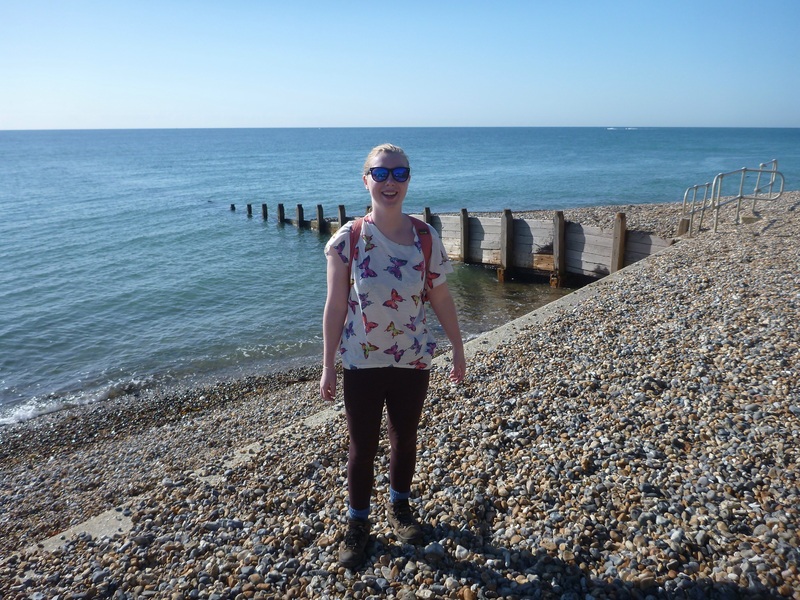 I started walking at about 6pm and had decided at last minute to split the trek back to Felpham in two, particularly after my last adventure. From the Windmill at Medmerry I headed due south to the sea and walked along the coastline for probably a kilometre before having to walk through some residential streets. The views looking back towards Portsmouth on this stretch were fantastic and it made me think about how far i had come on this trek so far. 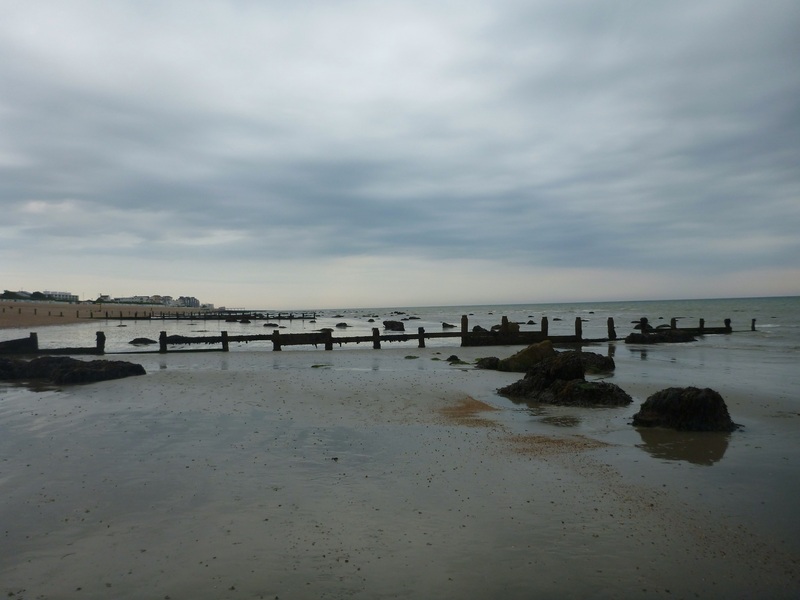 After walking through some streets I was back on the seafront and at the Selsey Bill, the furthest point out on the peninsula and another corner that will be turned, I will no longer be able to look back along the coast and see where I have been, but instead can see the way forward and where I will ultimately end. 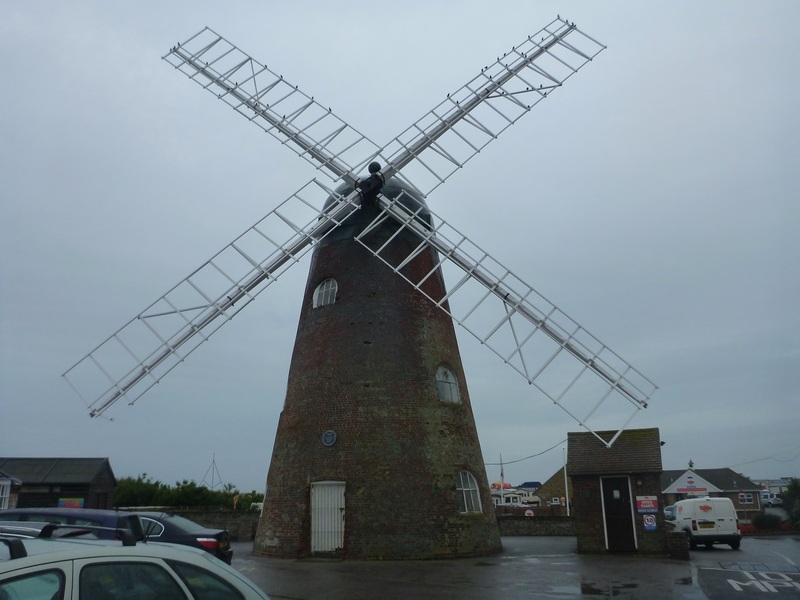 The Bill was a little disappointing as there was not a lot there apart from a falling down sea defence and a nice big house. On the eastern side of the Bill was a promenade to walk on. 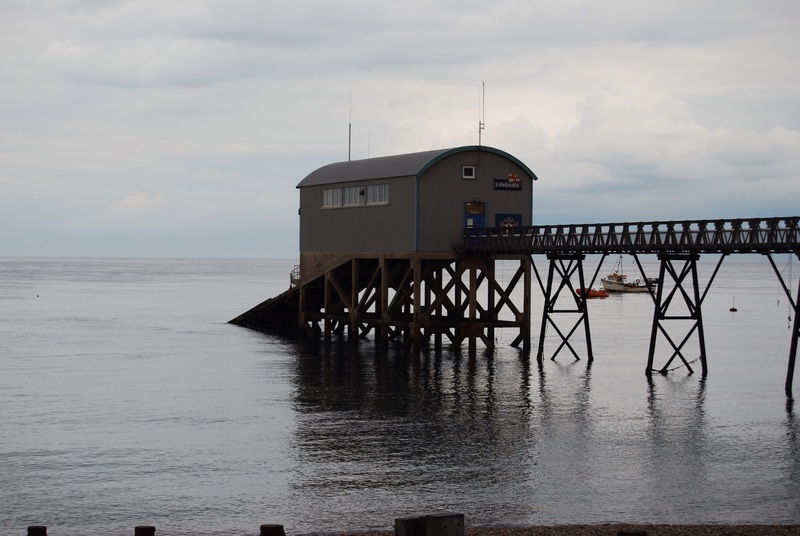 This was a much more interesting part to selsey, the sea was really calm, the fishing boats at anchor were gently bobbing in the small waves and the lifeboat station can be seen standing proud in the sea. 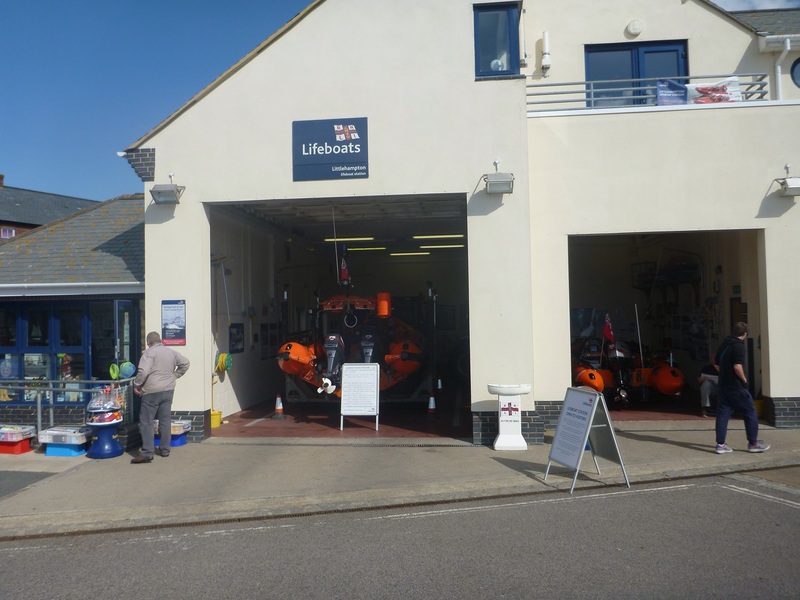 The Selsey lifeboat has been present in the town since 1861 and is now housed in a shed about 100m off the shore and when called upon will slide down a ramp into the sea. Selsey is famous for it’s lobster and crab and has a unique taste that is sought after in many restaurants, the fisheries where the shellfish is prepared can be seen along the shore to the east of the lifeboat station, they had closed for the day when i passed by, but the smell of the shellfish was very poignant in the air. 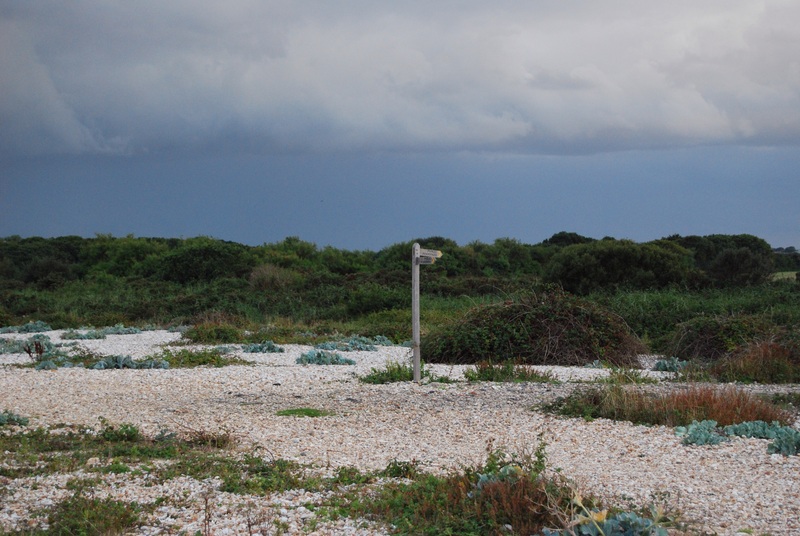 Near the end of the promenade I had to leave the coast for a short walk through some farmland to Pagham Harbour Nature Reserve, the pickers were still in the fields gatthering up the last of the veg before the sun set and the light goes. 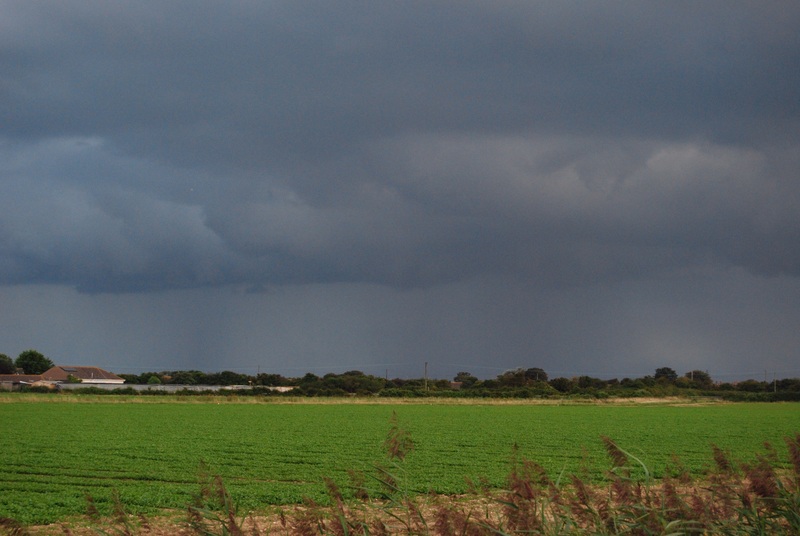 Looking back through the fields i could see how lucky i was that i missed the rain, the sky was so black. 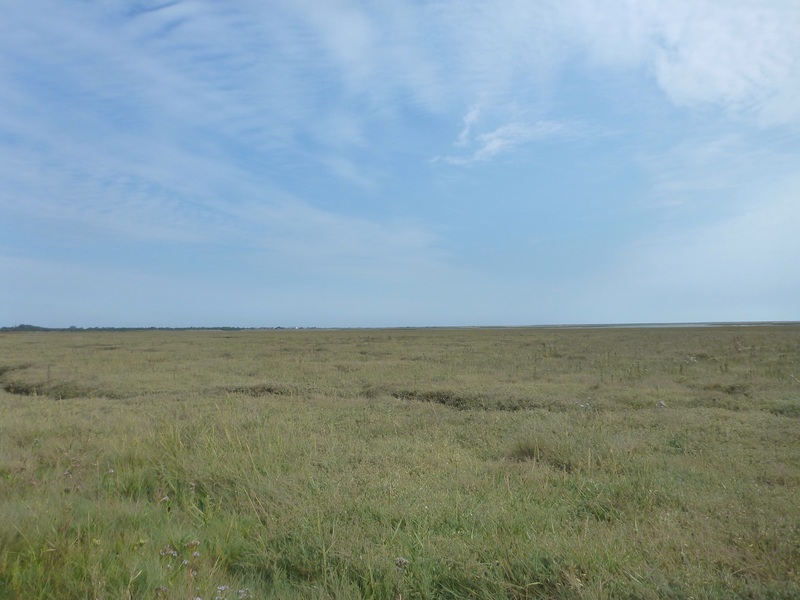 On reaching the nature reserve it was a scene of tranquility, i was now once again away from the open sea and sheltered from the prevailing wind. The sun was just setting and soon the light would be fading. 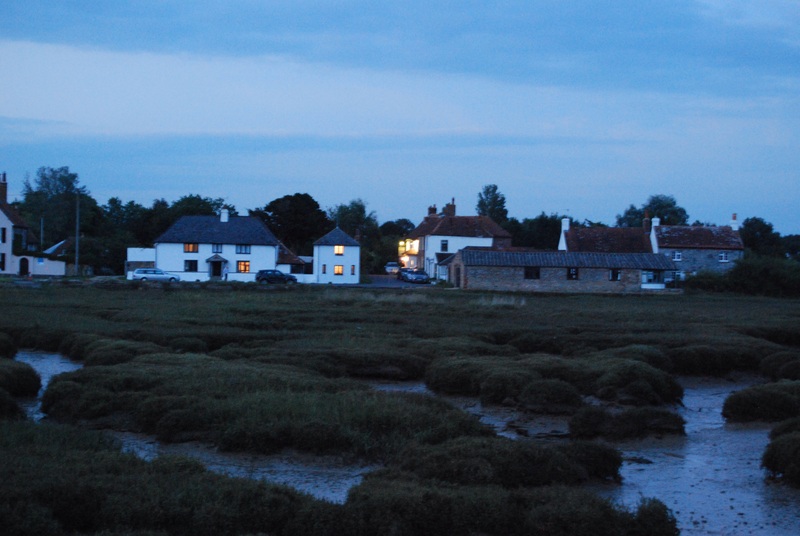 I could see the lights of Pagham and Church Farm Holiday Village across the harbour one by one switching on. 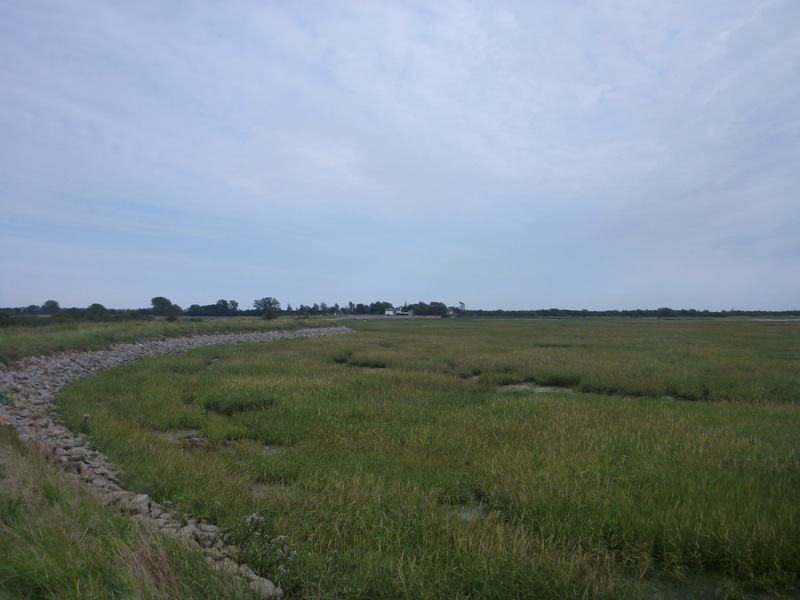 The walk from here is following the edge of the nature reserves harbour all the way around to Sidlesham, it is a tidal harbour where the sea fills and empties it every day. 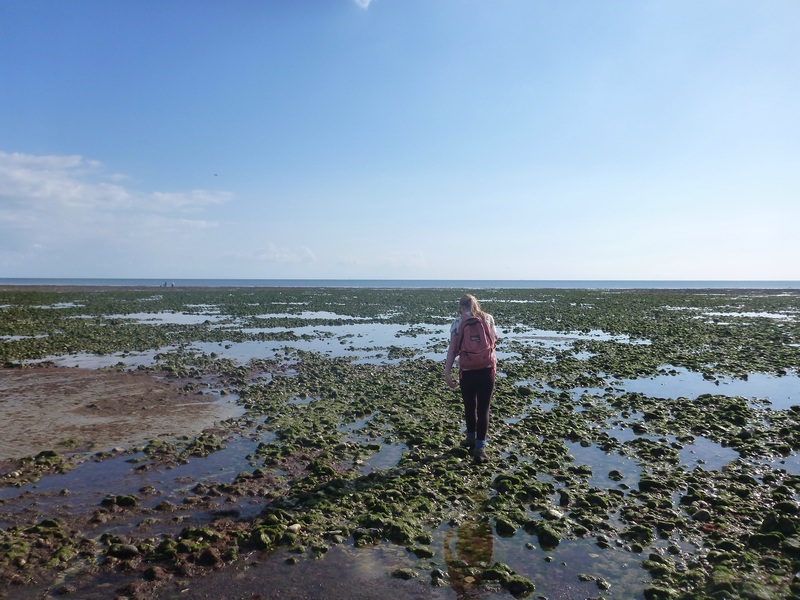 Fortunately i have the timing right this time as the tide was out which allowed me to take the path closest to the waters edge. 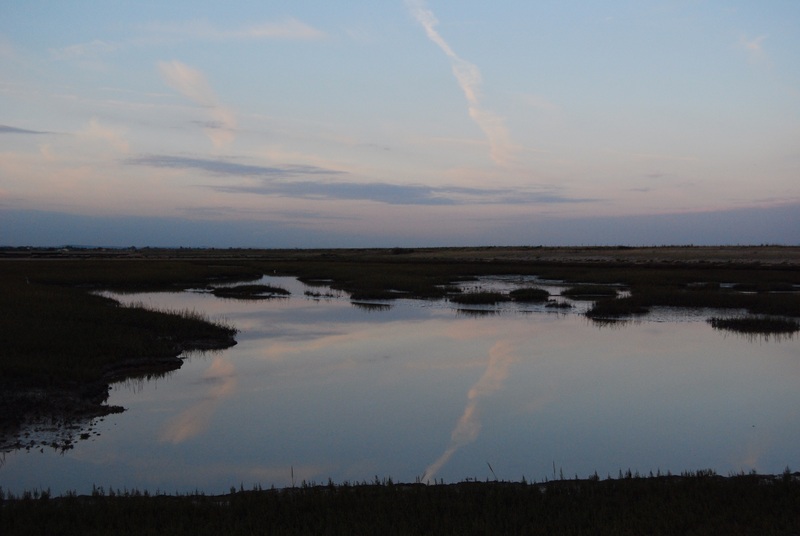 The sound of the many water birds could be heard in the air and in the bushes, singing and making their final calls for the day before settling down in their nests for the night. On reaching Sidlesham the light had just about gone, which showed a different beauty to this little hamlet. The Crab and Lobster a local gastropub in this hamlet was certainly busy on this Friday night and would have got my custom if Susan had been with me. A short walk back to the car finished the shorter trek for today. 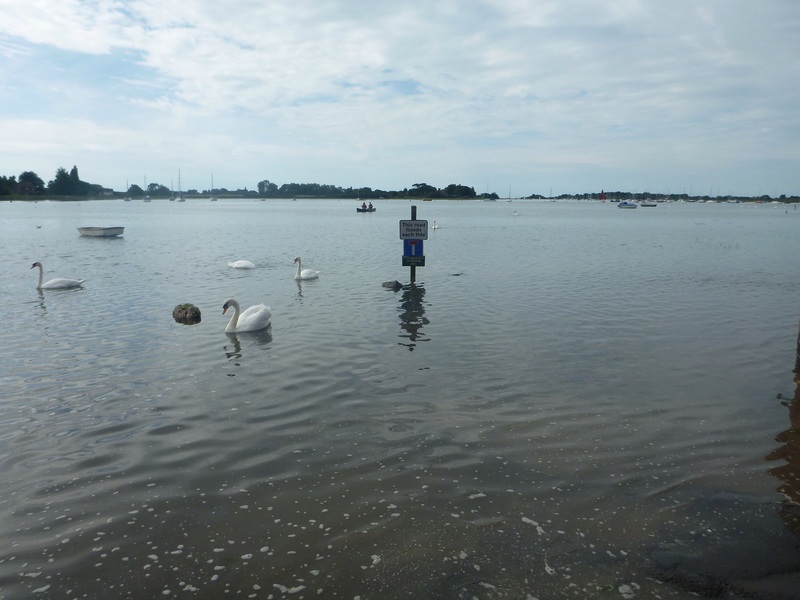 Today I have cookie and Kiah walking with me, an added challenge with two dogs, so after catching the train to Bosham and a bus down to the quay we were ready to start. 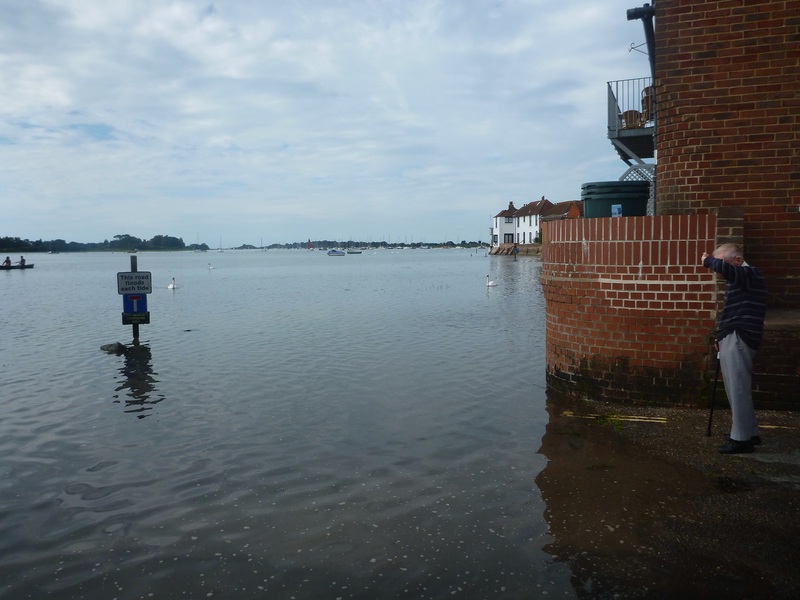 When we finished up at Bosham last time the tide was going out and we were able to walk along the tidal road a little way, however on my return today the tide was high and still coming in so the road was flooded, fortunately there is a sea wall with a raised footpath that you can walk around the Bosham Harbour area. 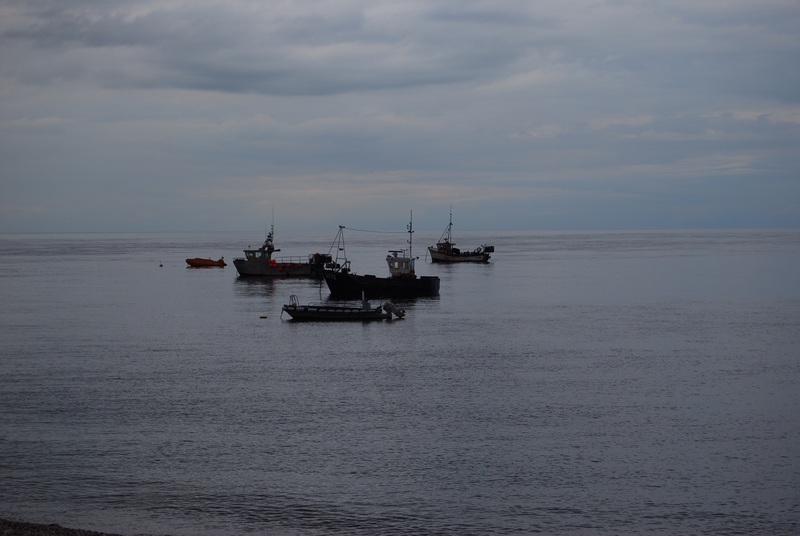 I must admit that this part of the country is one of my favourites, I don’t know what it is about the combination of the sea, boats, harbours and the seabirds that make it so beautiful. 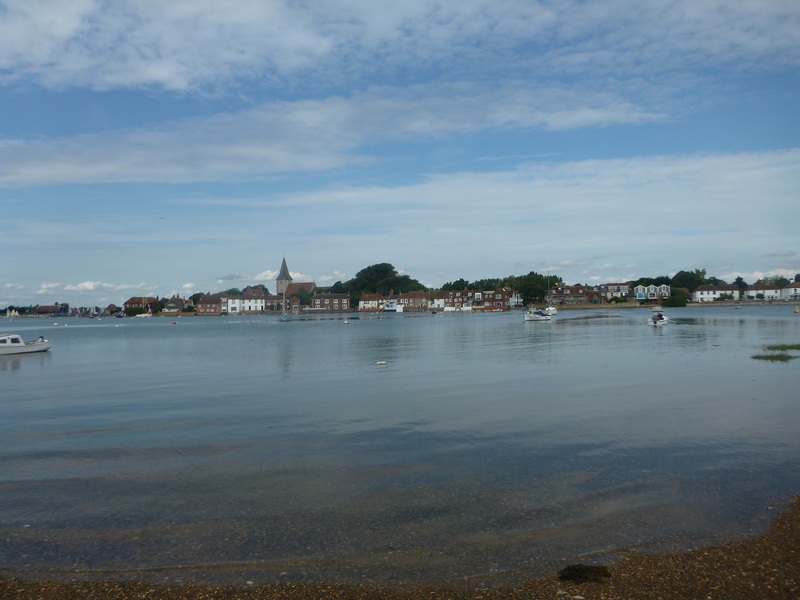 Following the coast around Bosham harbour means that you get to see the village from various angles and all the views are terrific. After following the wall, you rejoin the road which at spring tides would be totally covered, however I was lucky as only some of the road was covered although slowly creeping up the Tarmac, which meant just around the corner I had to wade through some water that covered half my boot over, lucky they are waterproof. 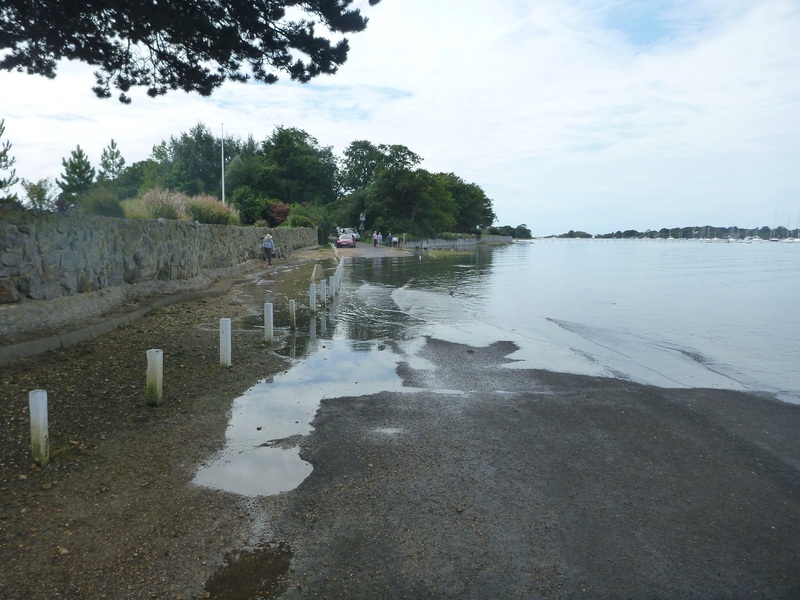 As it was high tide this meant that I was not able to walk around the footpath on the shoreline to the ferry, but instead had to walk along the alternative route along the road; which had a queue of cars on as people had not realised that the tide was high and the road impassable. The road beyond the queue was very quiet and was only about a kilometre long before a short walk through some woods to the Itchenor ferry. Just as I got to the ferry I could see it leaving, doh! But this was OK as it gave me some time to sit down and watch the world go by, I had to wait about 15 minutes and it arrived back, it is a small boat that seats about 12, the ferry pulled straight up onto the shoreline and lowered a ramp for you too climb on, after treading on a little bit of seaweed, having wet boots and two dogs in tow meant that this was not going to be so easy as the ramp suddenly became incredibly slippery, so after a bit of a cafuffle I got one of the dogs on and then the skipper helped me aboard as if I was 90 years old. Joining me on the ferry for this trip was three bikes, six people and three nervous dogs, particularly Kiah. 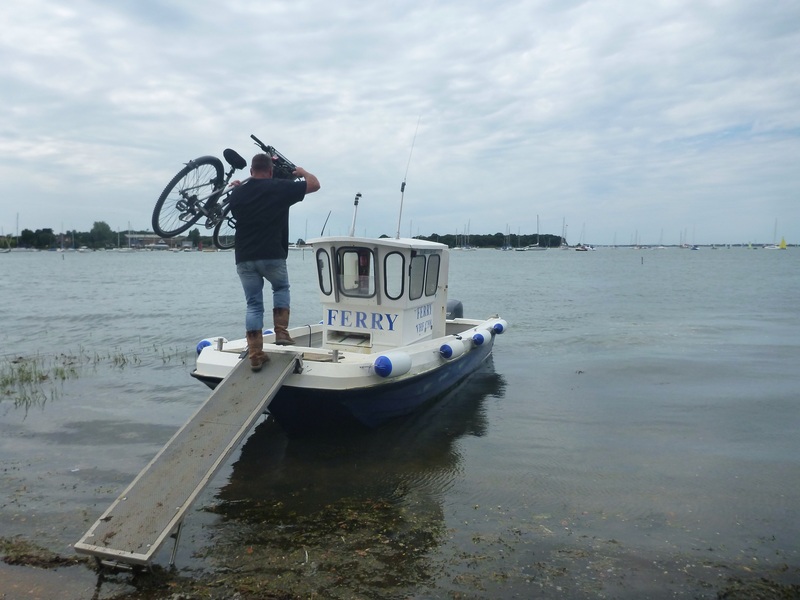 It didn’t take long for the ferry to cross the Chichester Channel and the docking at Itchenor was to be on a floating pontoon, so alighting was so much easier. The floating movement of the pontoon really did unnerve the dogs which made them walk really slowly and keep very low as if it was not safe. 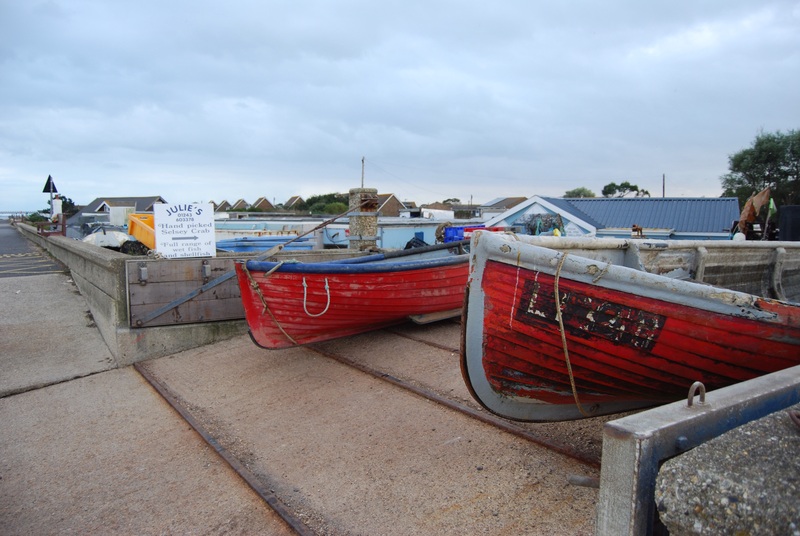 Itchenor is a beautiful sailing village with many exclusive large houses, a pub, a harbourmasters office and a boat yard, there were no shops there, which meant that I would have to wait a little longer for an ice cream. 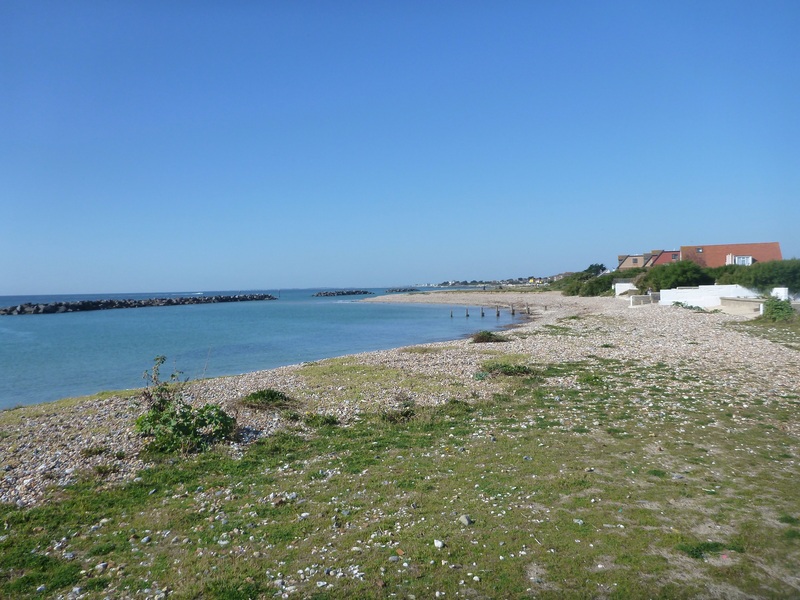 From Itchenor you continue around the shoreline on a path which now forms part of the Lipchis Way, another long distance path from Liphook to the Witterings. On this path you pass many beautiful residences that command fantastic views across the harbour, one can only dream of living in such a place. The Lipchis Way took me right down to the beach at East Head and just as I was approaching here I got the smell of many BBQs that were being cooked on, definitely time to put the dogs back on their leashes otherwise they would be running off with the sausages. 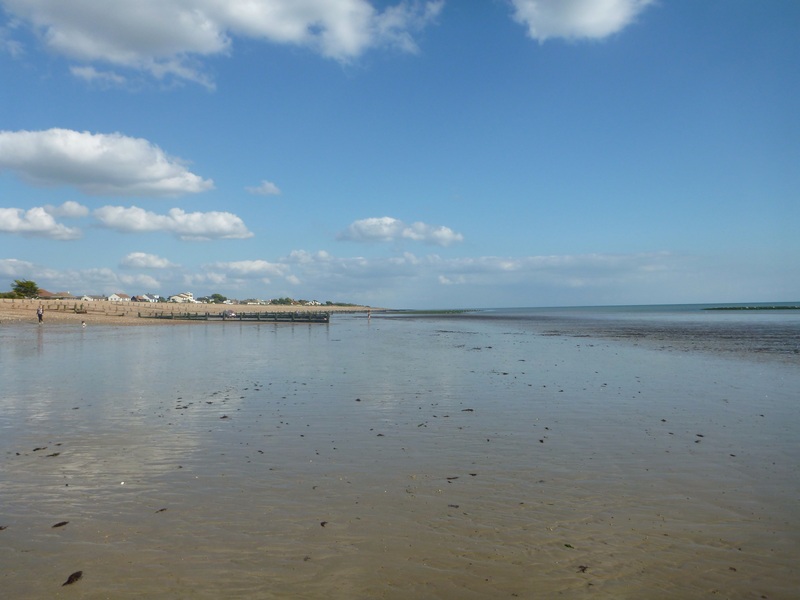 This is a very popular area for seaside day trippers from inland and London. The beaches here are made up of sand dunes with very soft sand. I’m not sure how much the parking is here but most people were here for the day. 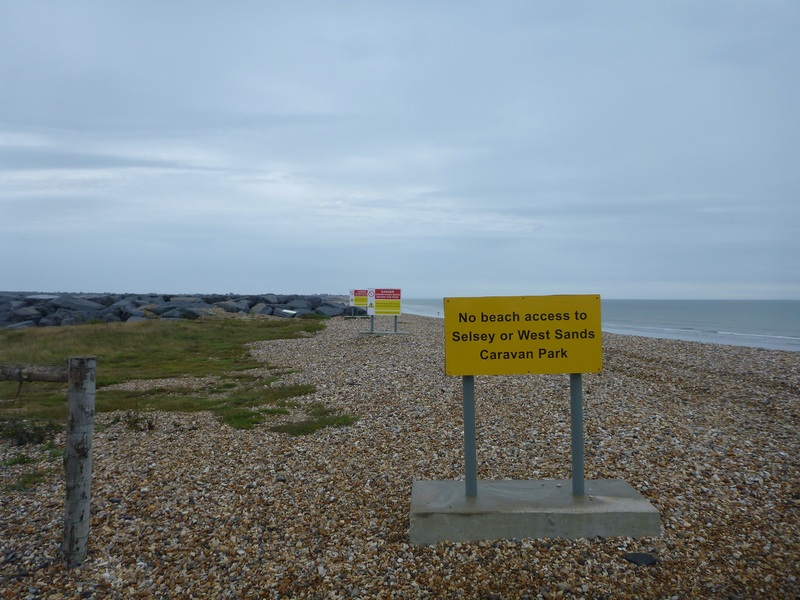 Dogs were only allowed on certain parts of the beach here, which is good so that there is an area for everyone. 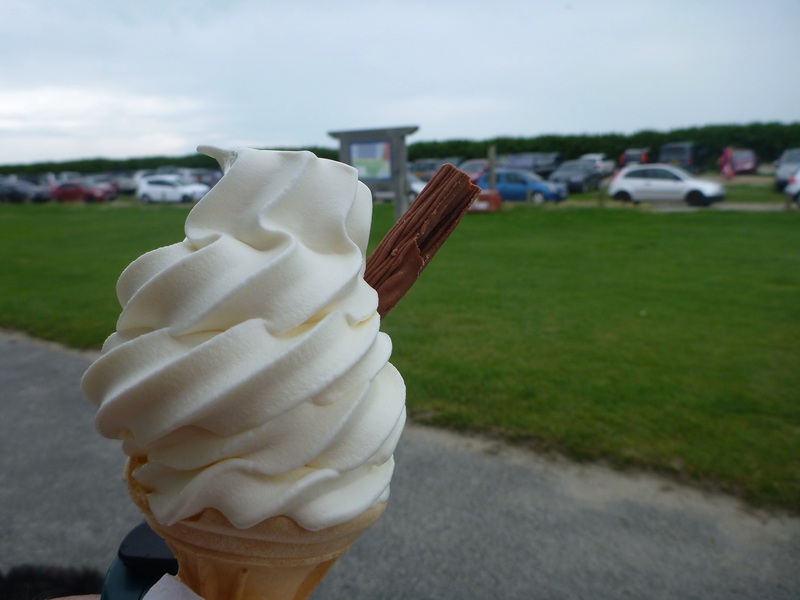 There were a few food outlets here containing a burger stand, fish and chip stand and a few cafes, it was time to get my ice cream here, a Mr Whippy with a 99 flake was the order of the day, it cost £2 but I got to admit it was a big one. Literally just after buying the ice cream and taking my first few licks it started to rain, first by just spitting and then with a much heavier downpour, this meant that i had to quickly woof down the ice cream so that it was’nt washed away. Timing not so clever I think. 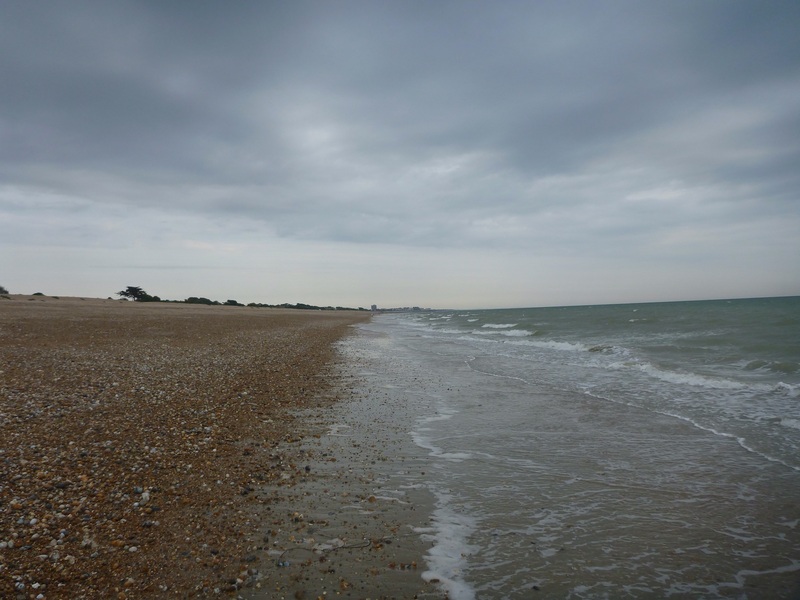 The rain was quite heavy now and my walk from East Head car park was to be along the beach at West Wittering with views out to the open ocean, such views i have not seen since setting out on my trek at Bournemouth. 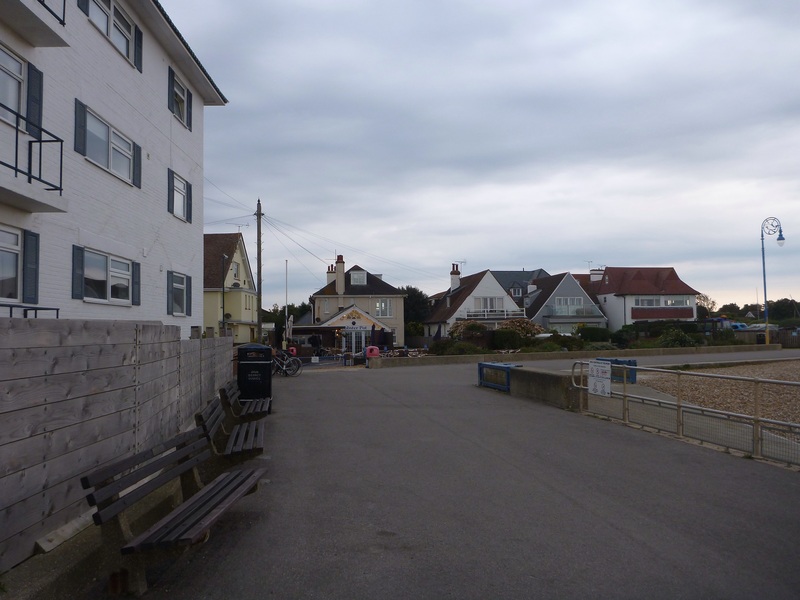 We continued on the promenade at East Wittering, past Peter and Jo’s former house (hasn’t changed much in 18 years) and through the estates to Bracklesham Bay, the only way was around as all the foreshore houses from here seemed to have private beaches. 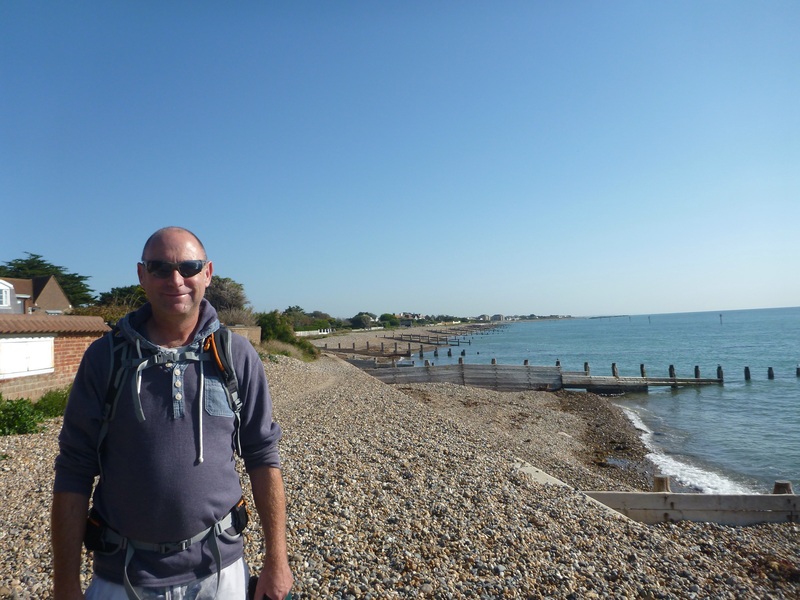 The next stage of the trek is where my problems were going to occur and if I had known what was to lie ahead I would have stopped the day at Bracklesham Bay and had a coffee in Billy’s cafe right on the seafront (I would certainly recommend that is what you should do). 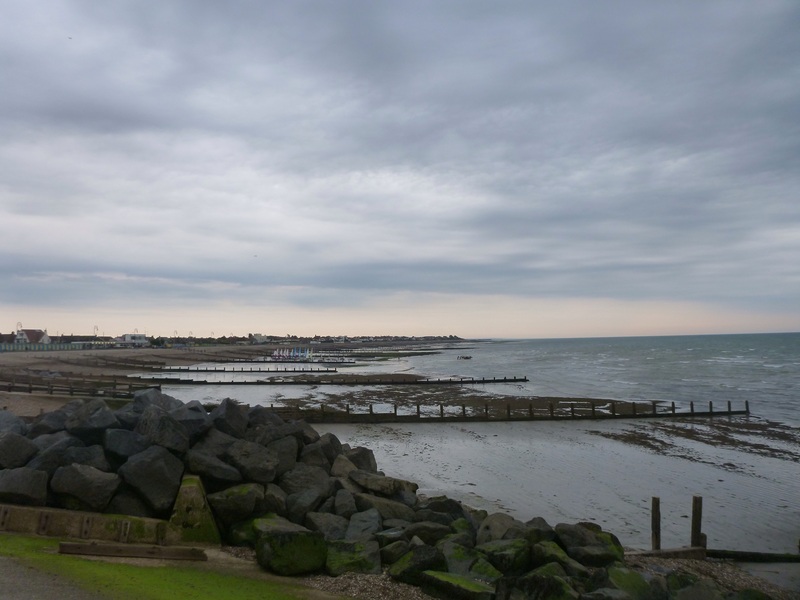 So from the car park we walked along East Bracklesham Drive to the end and then down on to the sands, the dogs didn’t like walking on the pebbles as it tended to hurt their paws, so I let them off on the sand and we walked right on the edge of the sea. We could see that West Sands caravan park was not too far in the distance and that we would not be too long in reaching there, the beach as we got nearer was becoming not so nice as there were some large iron poles probably old war sea defences sticking out and the sand was becoming very clay’y. I was thinking that I didn’t remember these the last time I walked along here, anyhow onward I plodded and could see the holiday centre only a couple of hundred yards away when all of a sudden I came across an outlet which was about 20 metres across with very fast flowing water from the land, I could not believe it, I had a quick scout around and there was no way that I was going to get across here, it was all to do with flood relief works and realignment of the Medmerry head allowing the sea to reclaim some of the land thus protecting the caravan parks and houses in the area. So after admitting defeat and the fact that I was not going any further I turned around and started to retrace my footsteps back. My face was a picture of mega grumpiness……..lol. I had walked back approximately 1.5 km when I saw some people on the top of the stone bank so thought I would head up there too, only to see a series of signs saying no access to West Sand along the beach and that I would have to follow the detour around the environment agency works, why was there not a sign lower, if only I had walked up higher I would have seen these signs. The walk around this new flood plain added another 9km on the day, Cookie was not happy, my face was grumpy and Kiah still seemed to have the energy to run around like mad. We finally reached West Sands and all the holiday makers were in the clubhouse bar supping their pints overlooking the wet landscape. This is where I was going to finish so I headed for the bus stop only to see the bus pulling away, so I walked into the town centre and caught a bus from there. The final part of the day was also not without incidence, however, when I look back now i suppose it was quite funny. When I got onto the train, it was very crowded so I had to hold the dogs in close such that they would not get trampled. The next thing I see is that Kiah has slipped her collar and making an exit from the train, I managed to grab her just before she jumped, fortunately a girl helped by holding cookie so that I could get Kiah back on the lead. The wet dogs thanked them by shaking themselves splashing their legs with the cold dirty water. After the 30km that i had done today i still managed to get to Arundel Festival to see some bands, goodness knows how, but i did!